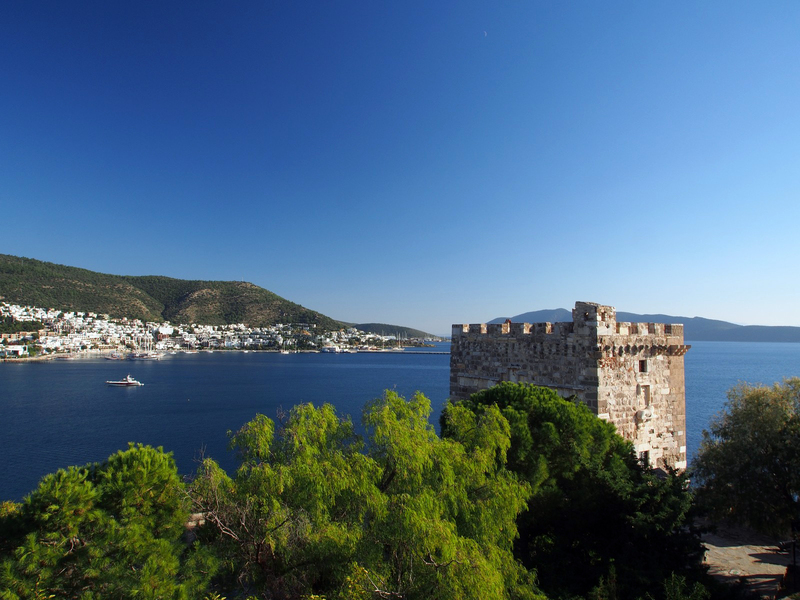 Bodrum is the centre of the Turkish Riviera, it’s where the jetsetters and rich party crowd go during summer to cut loose with fun in the sun. 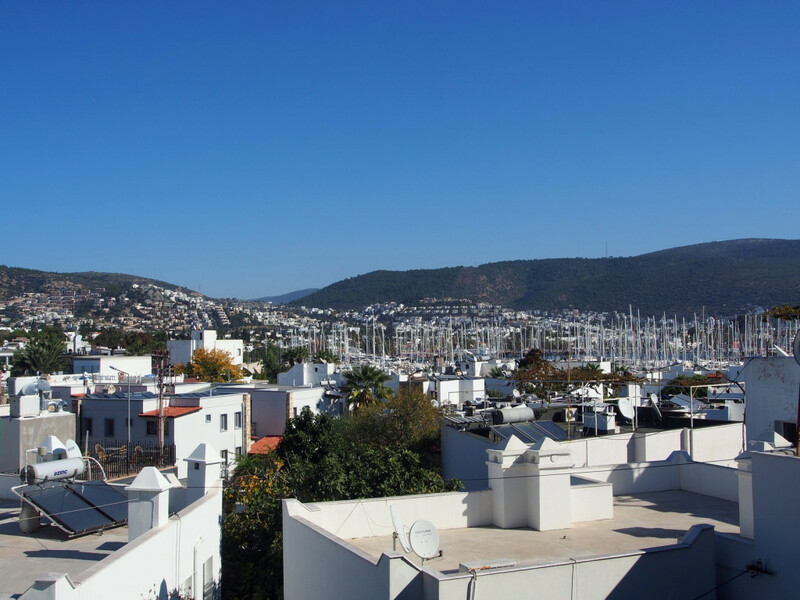 The harbour is a forest of yacht masts, and the town is typically Mediterranean with white walls and narrow cobblestone streets. 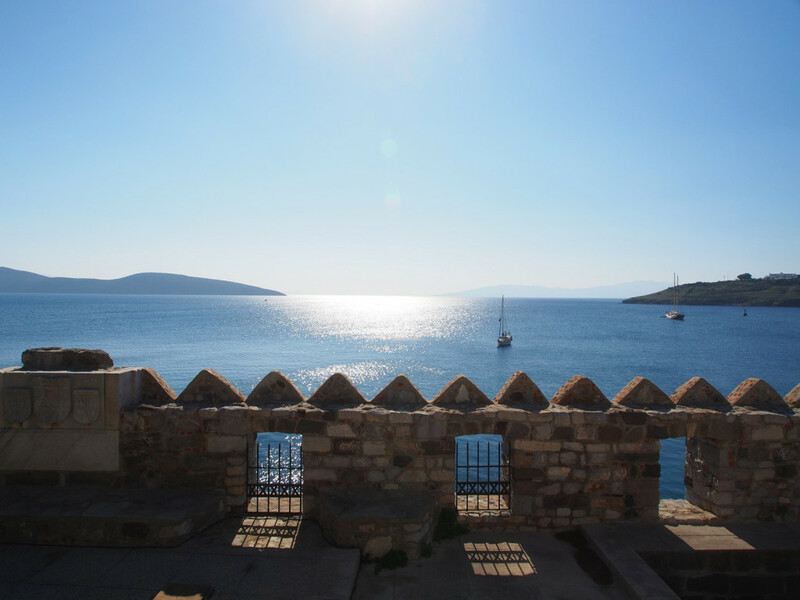 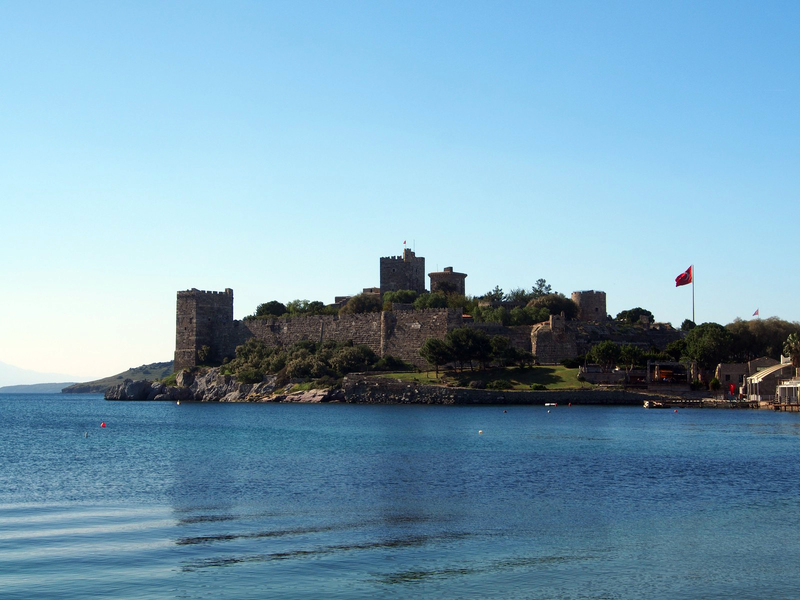 As a history buff, one of the biggest attractions here is the Bodrum Castle, built by the Knights of St John, the Knights Hospitallers. 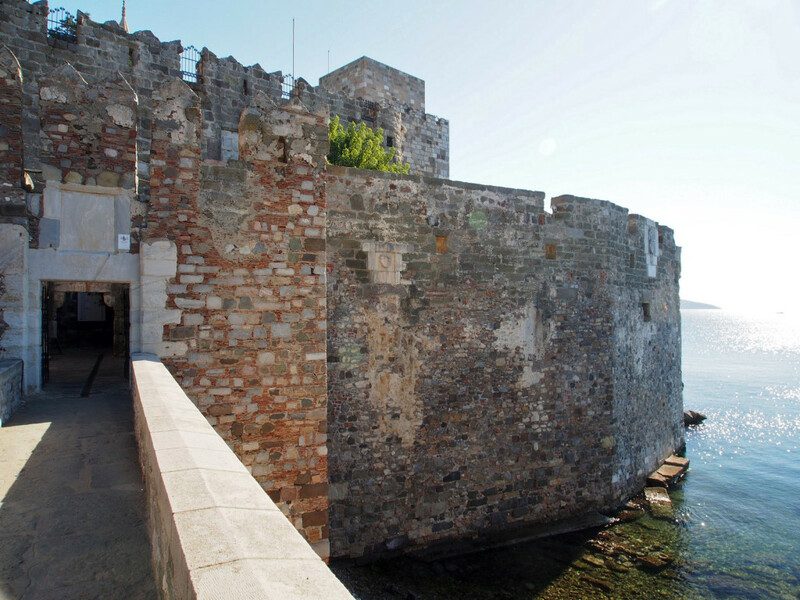 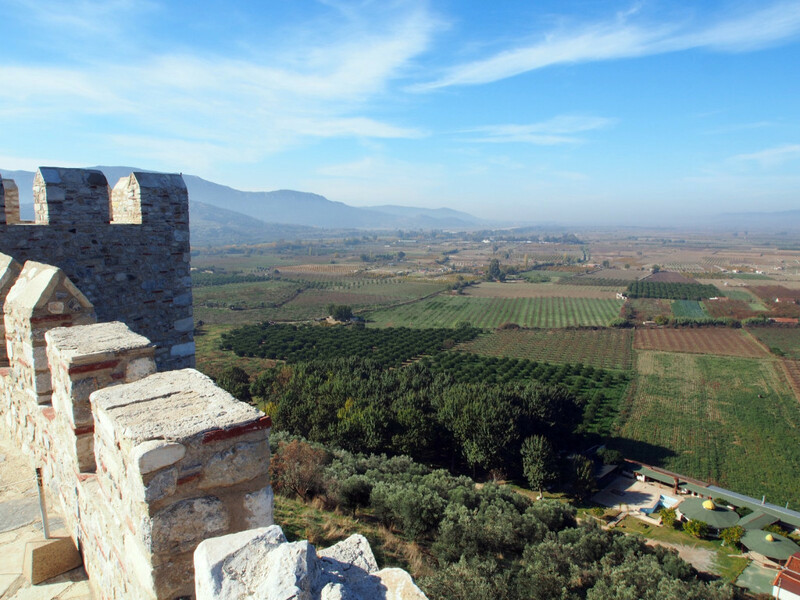 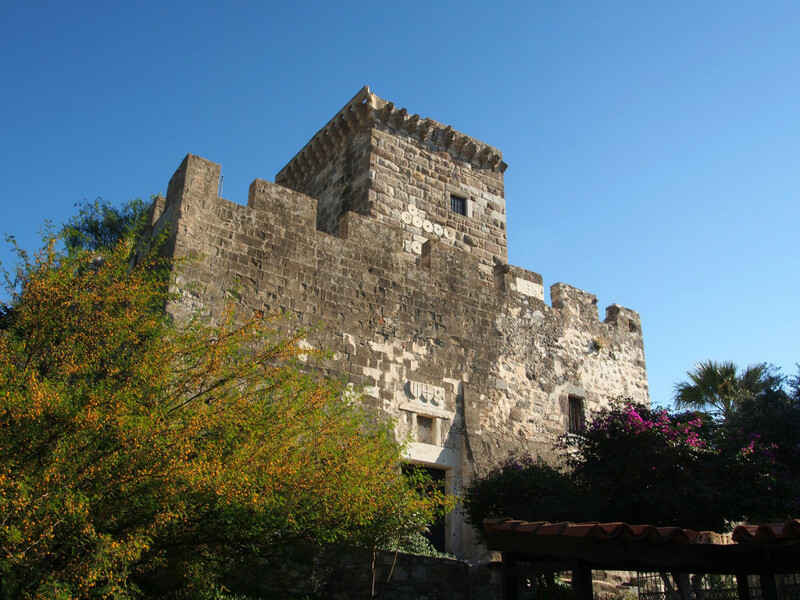 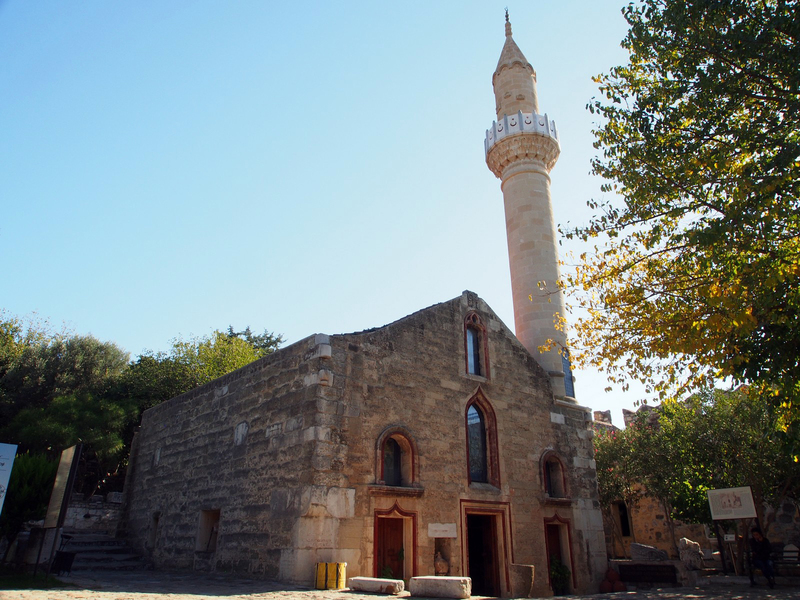 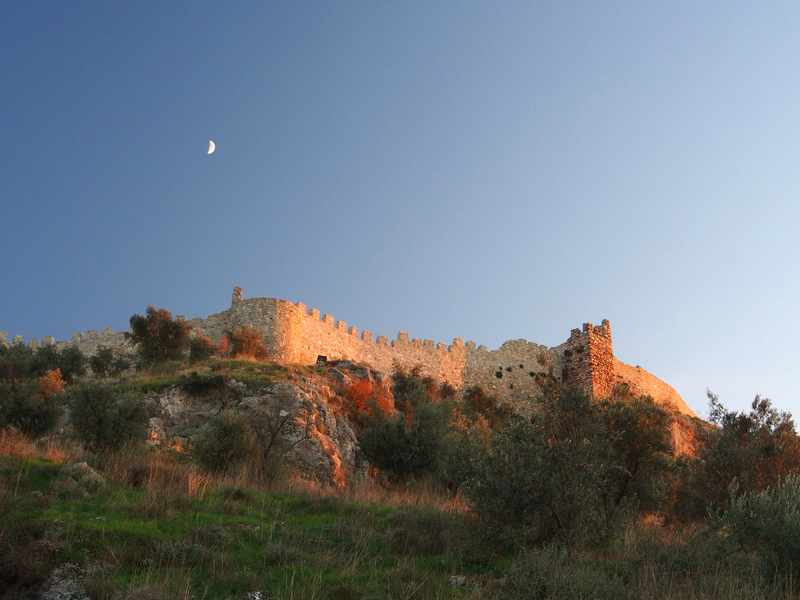 It’s an enormous structure, built in the early 15th Century, although it never faced a true siege – being surrendered to the Ottoman Empire when the Knights’ home base of Rhodes fell. 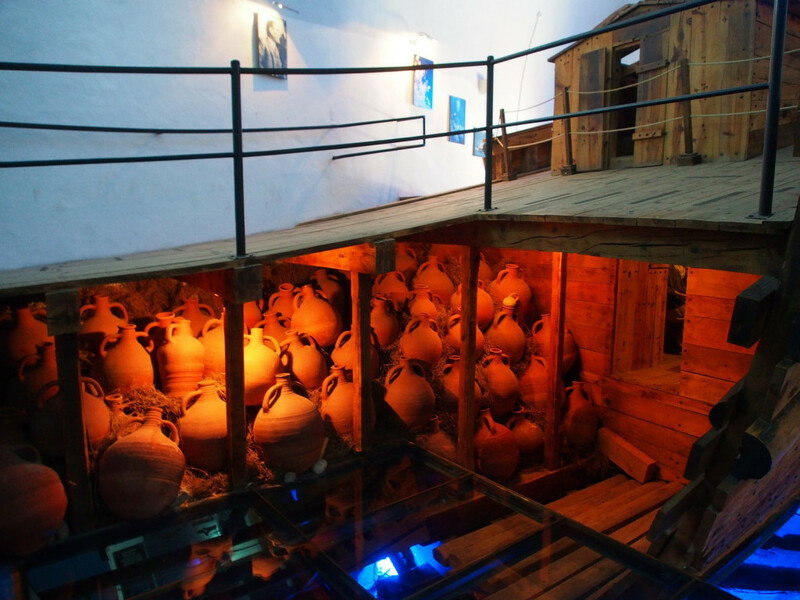 Inside a number of the buildings have been converted to house museum exhibits, primarily centred on marine archaeology. 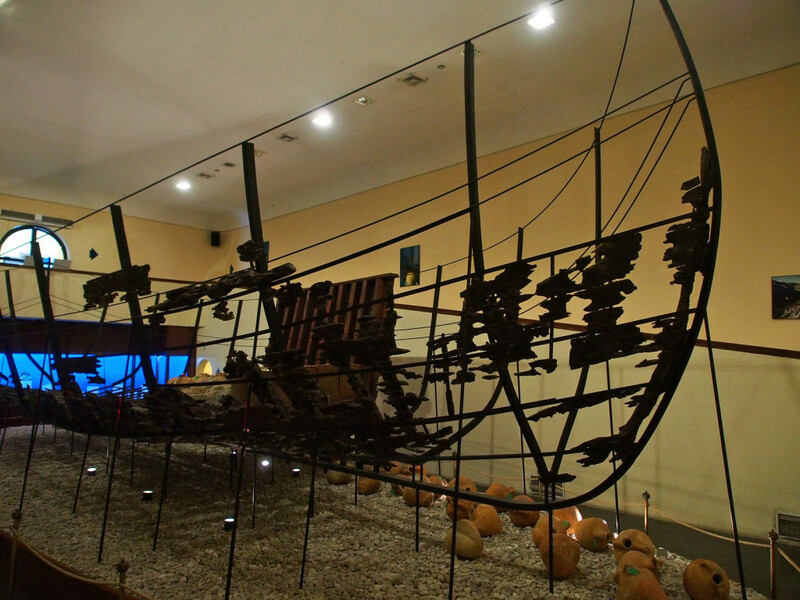 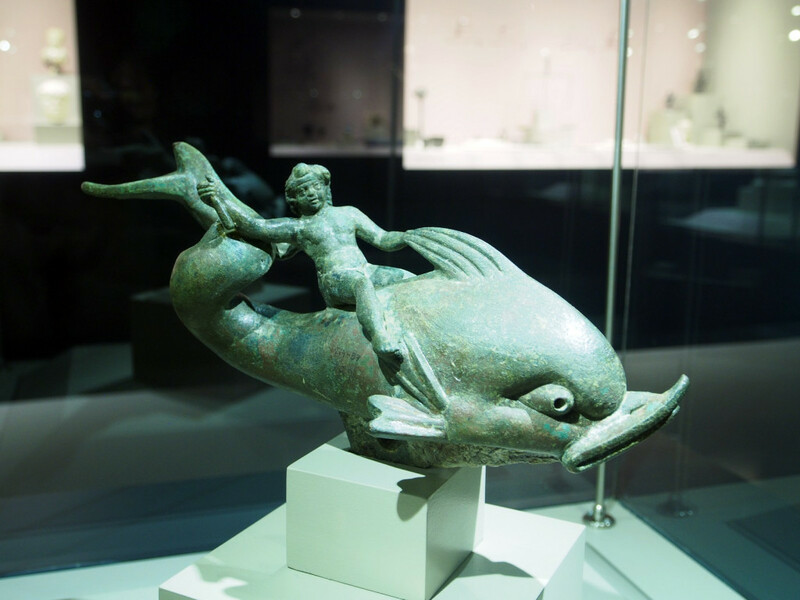 The chapel, for example, houses a reconstructed 6th Century small cargo ship, while another exhibit showcases what’s been recovered from the sea floor of a 10th Century ship. 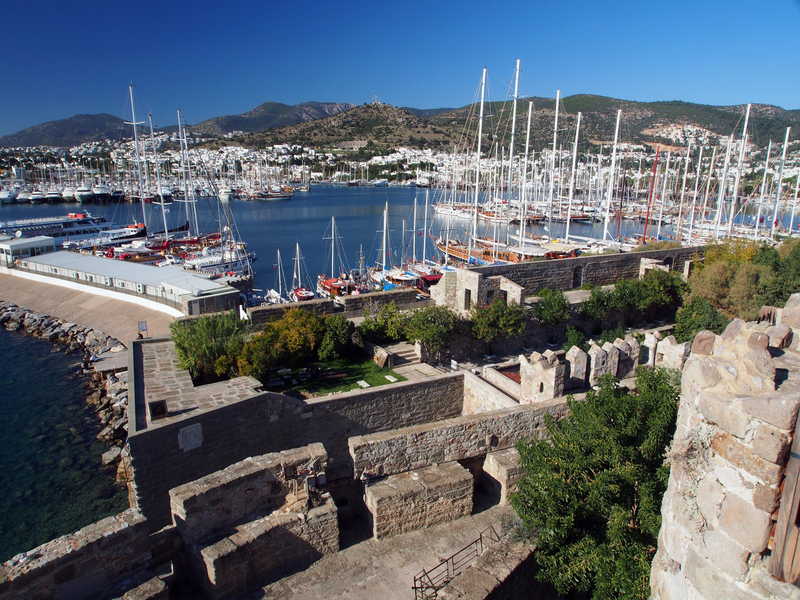 A tour around the walls gives great views over the marina and the rest of the town. There are a number of towers, each named for the representative nation – the Knights were a multinational group of volunteers. 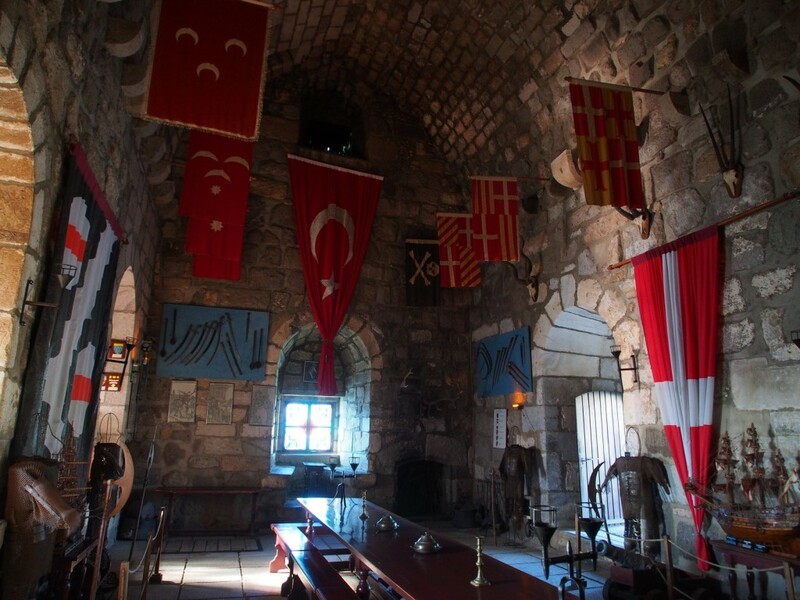 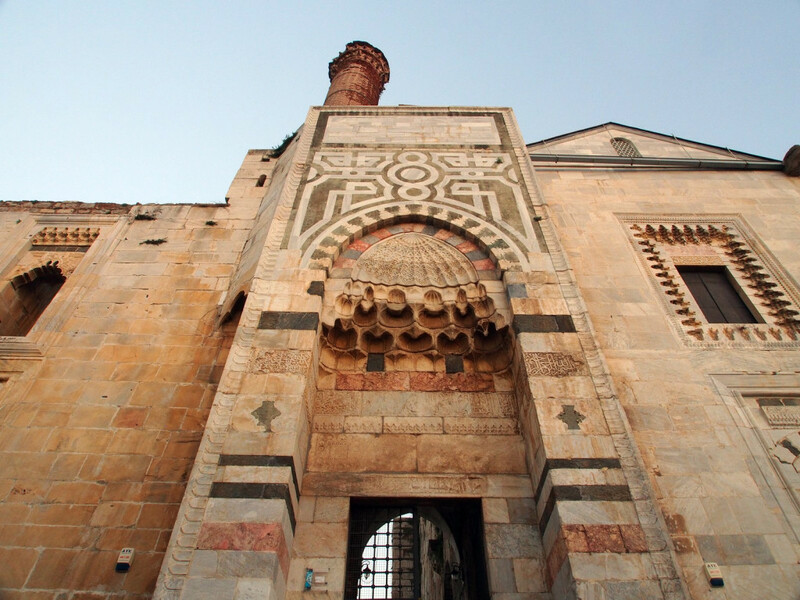 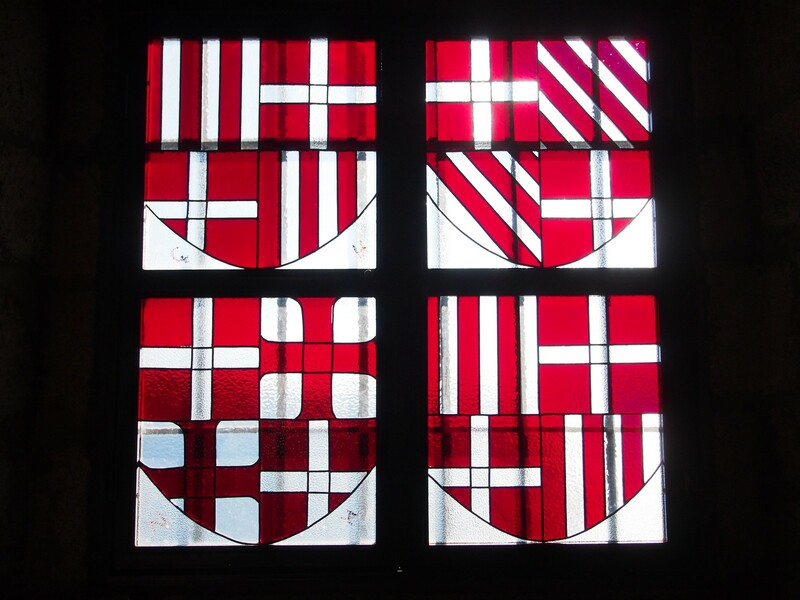 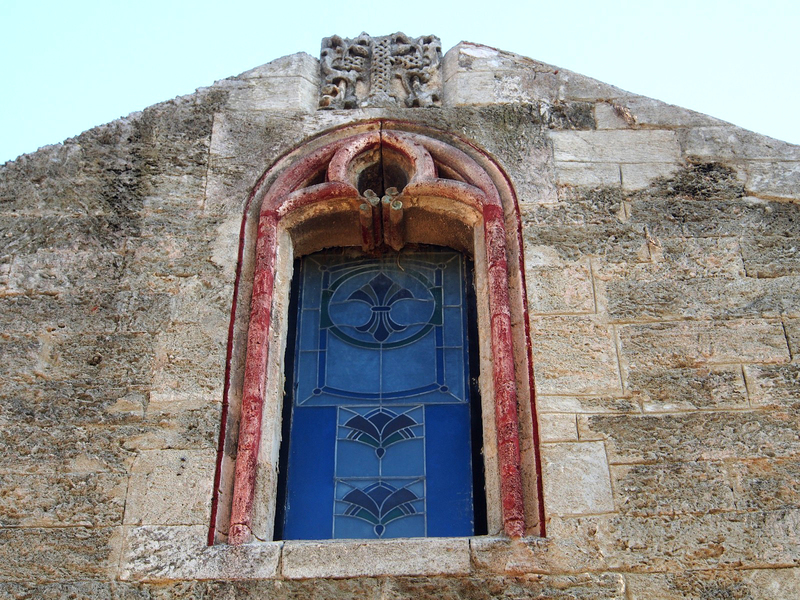 The English tower is perhaps the grandest, with stained glass windows, flags and inscriptions representing the heraldry of the serving knights (and later of the Ottomans). 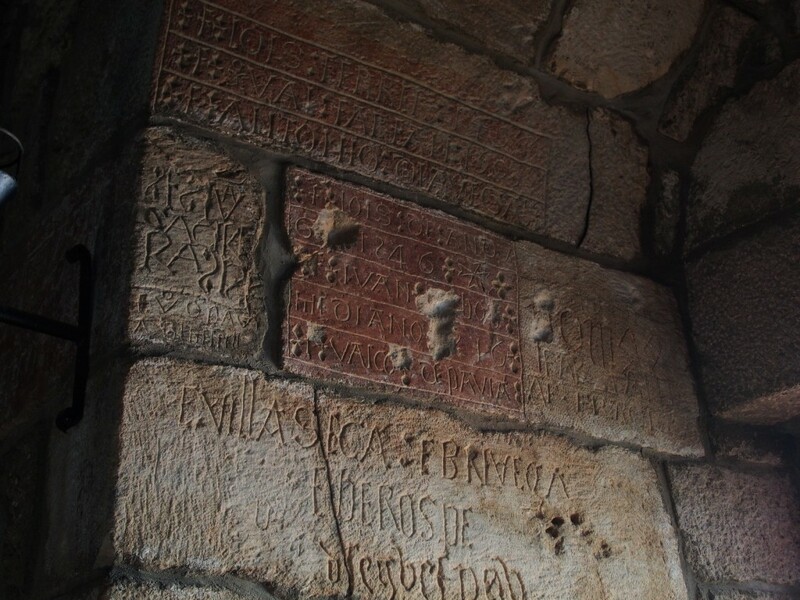 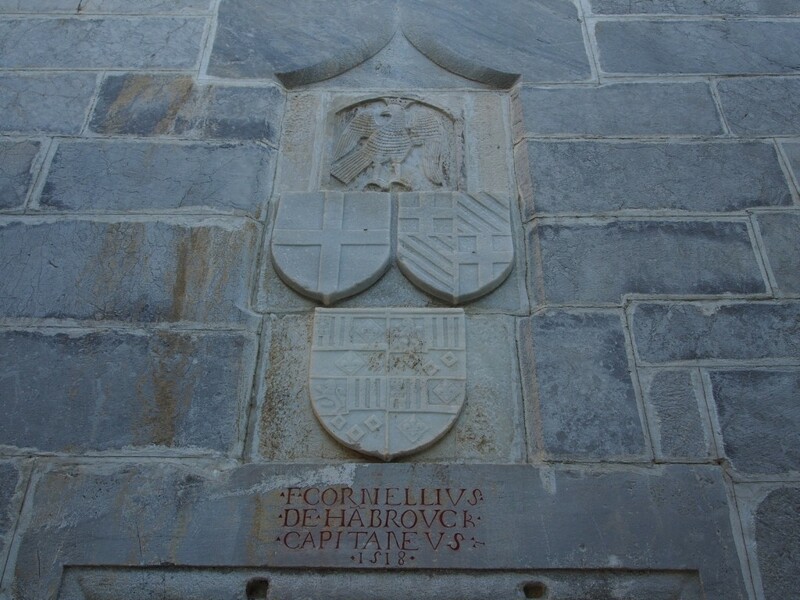 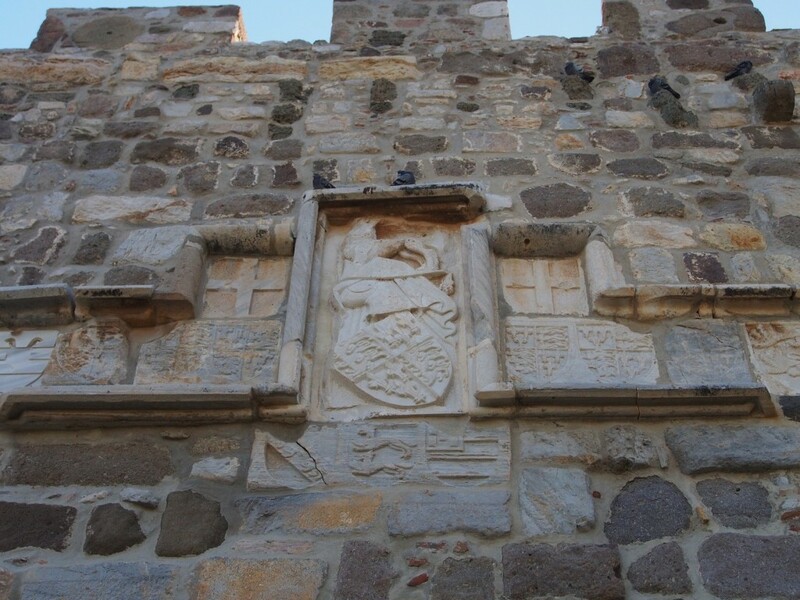 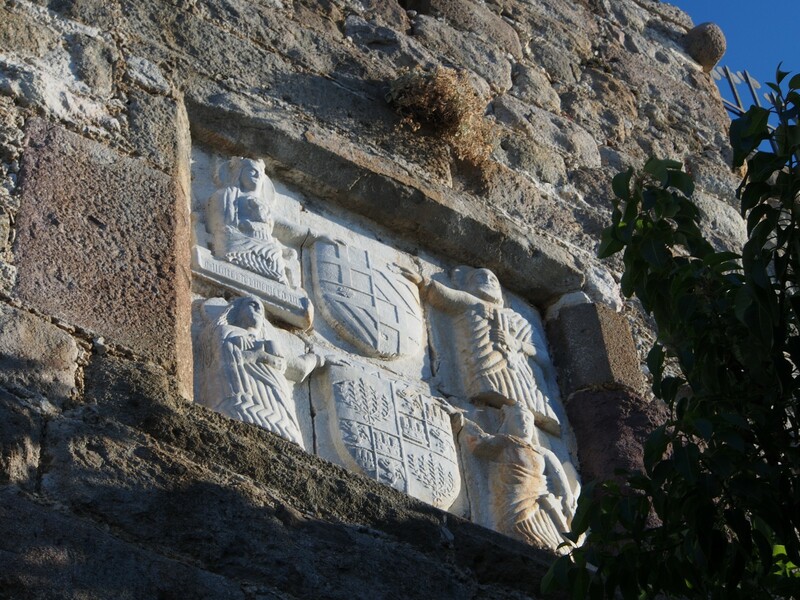 All over the outside of the walls and towers are various marks of heraldry, representing the families, nations and knights that resided here or contributed financially to the construction of the castle. 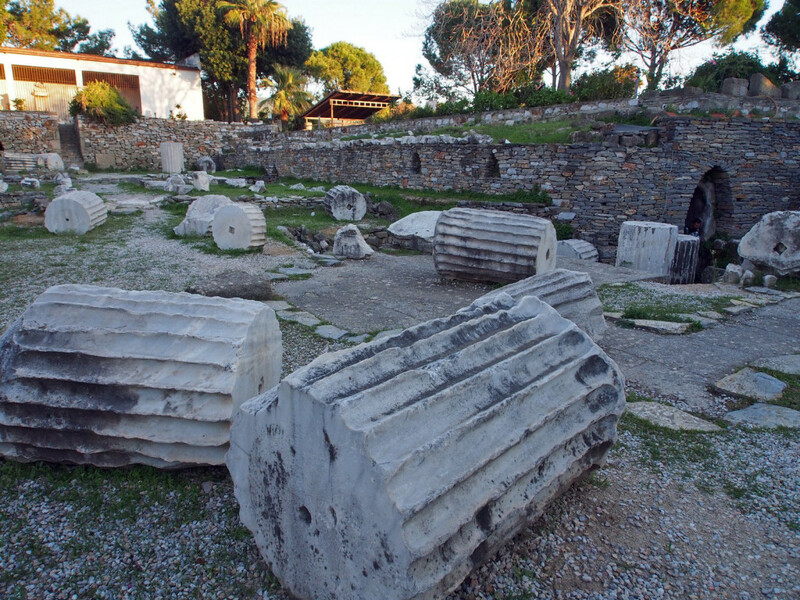 The other historical attraction in Bodrum is the Mausoleum at Halicarnassus – one of the original Seven Wonders of the Ancient World. 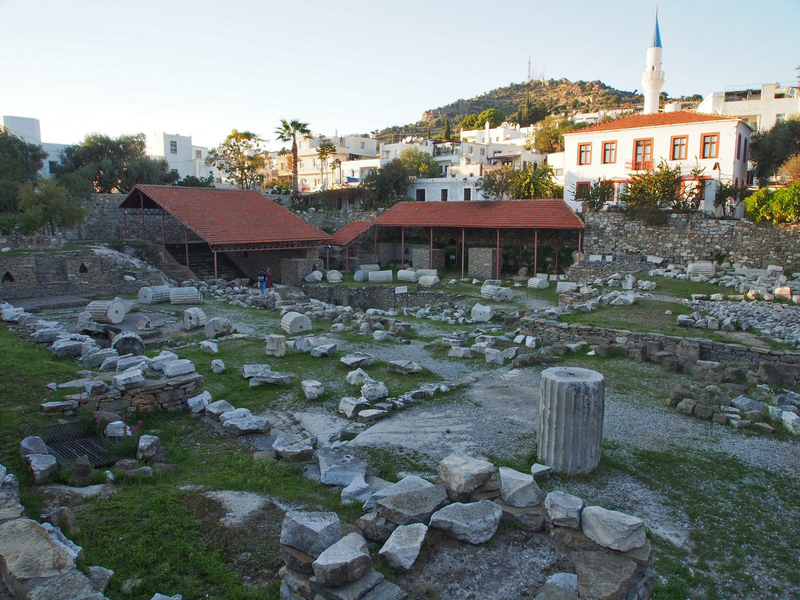 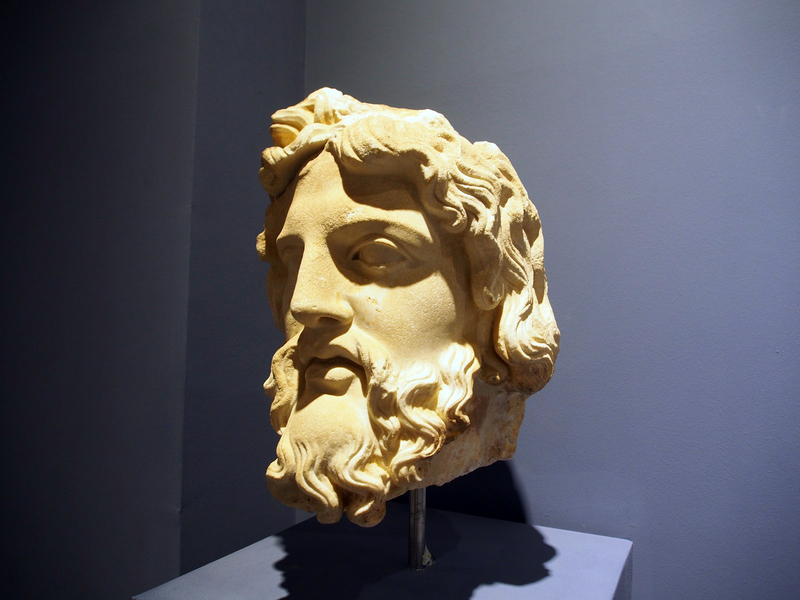 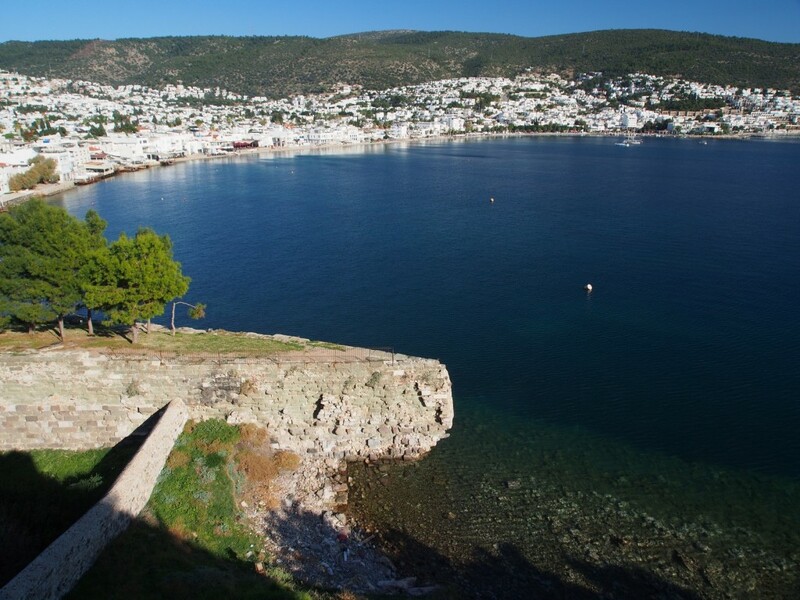 Dating from the 4th Century BC, the local ruler under the Persian Empire, King Mausolus, started an enormous program of conquest and city-building in Bodrum, and after his death his wife (who was also his sister, incidentally) decided to build a grand monument to honour him. 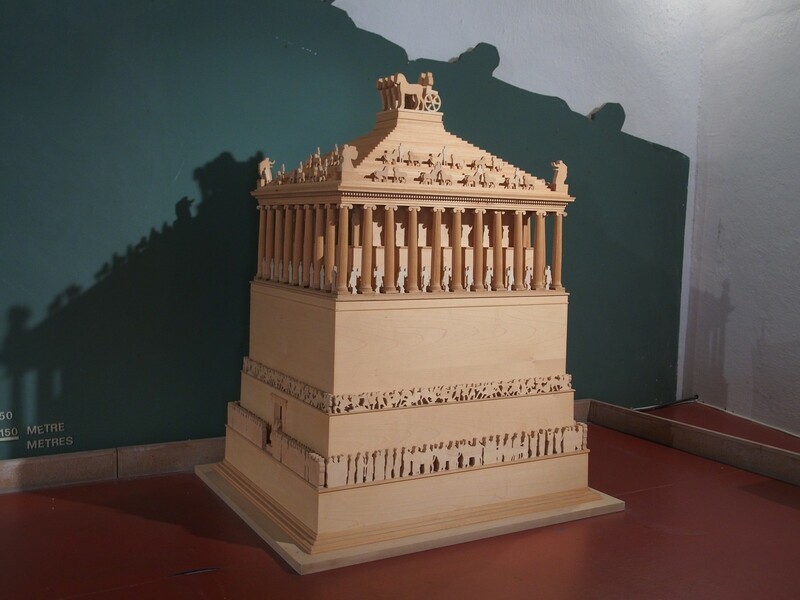 The result was a structure that, while larger than most buildings, was best known for the quality and craftsmanship of its carvings. 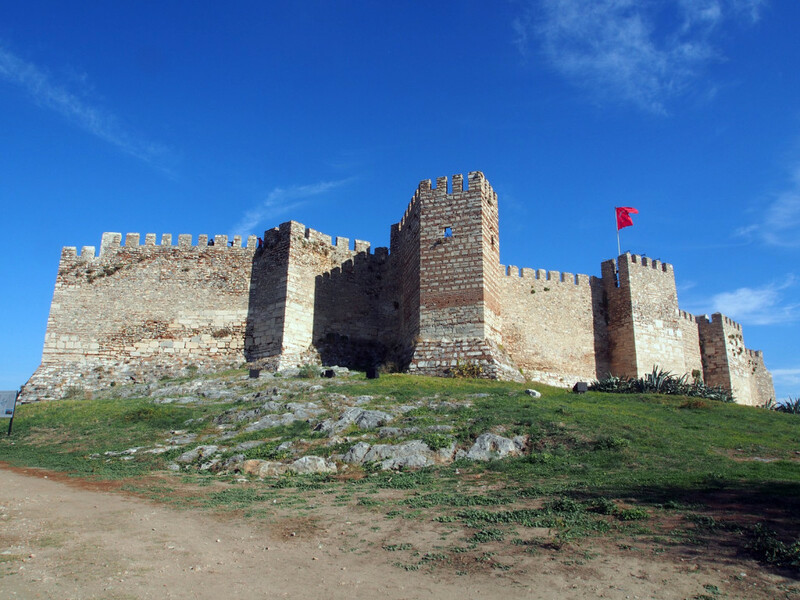 It was ruined in a series of earthquakes in the interceding millennia, and some of the collapsed remains were repurposed by the Knights in rebuilding the nearby castle. 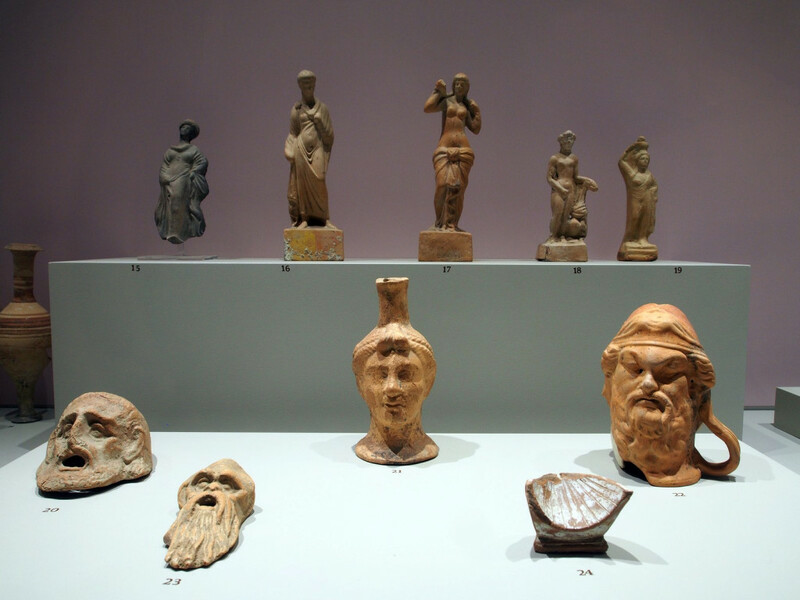 All that remains here now are some foundations, broken columns, and a model of how it once looked – all the best bits of the remaining friezes and sculptures are, like so many treasures of antiquity, in the British Museum. 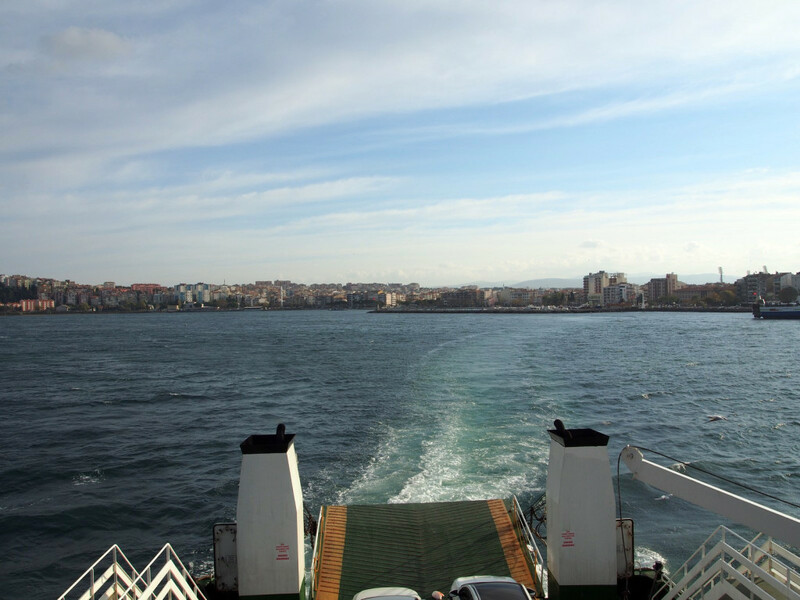 It was finally time to start heading north, towards Istanbul and eventually Europe. 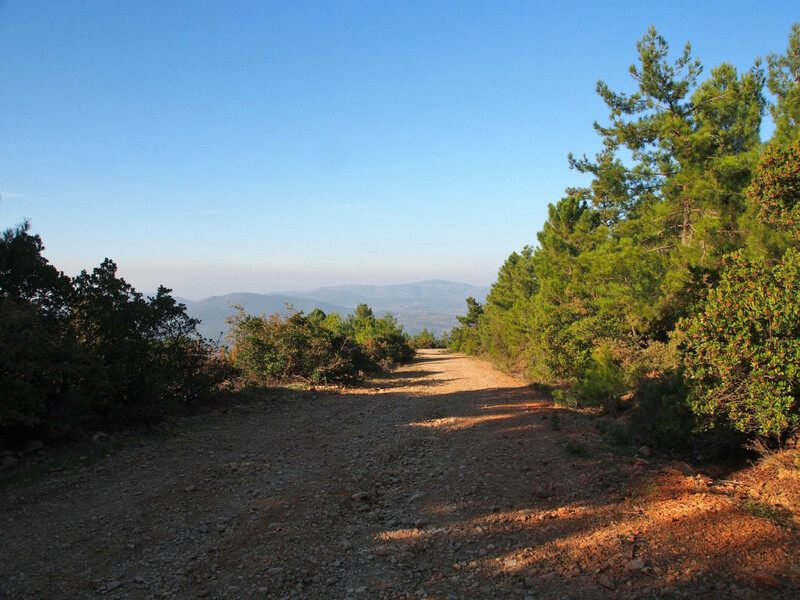 We took some back roads on the way to Selcuk, surprising a few local hunters and farmers on the rough narrow dirt tracks. 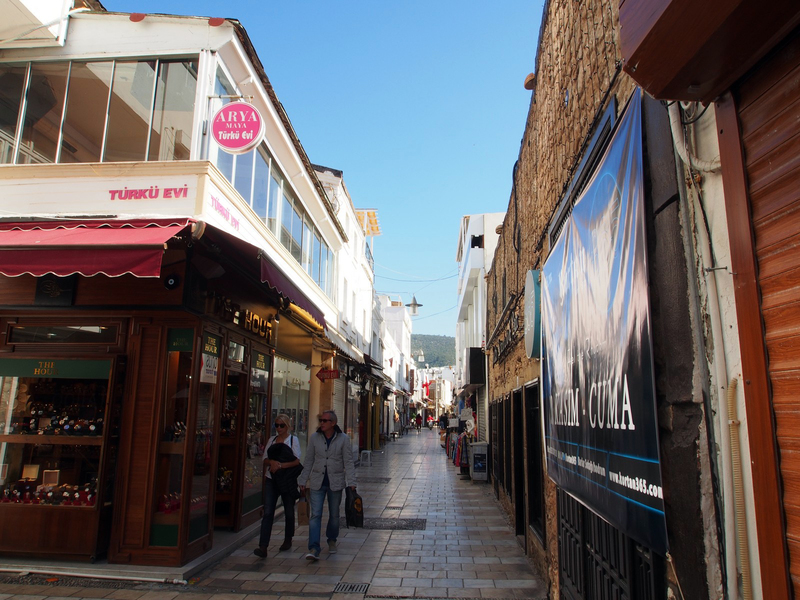 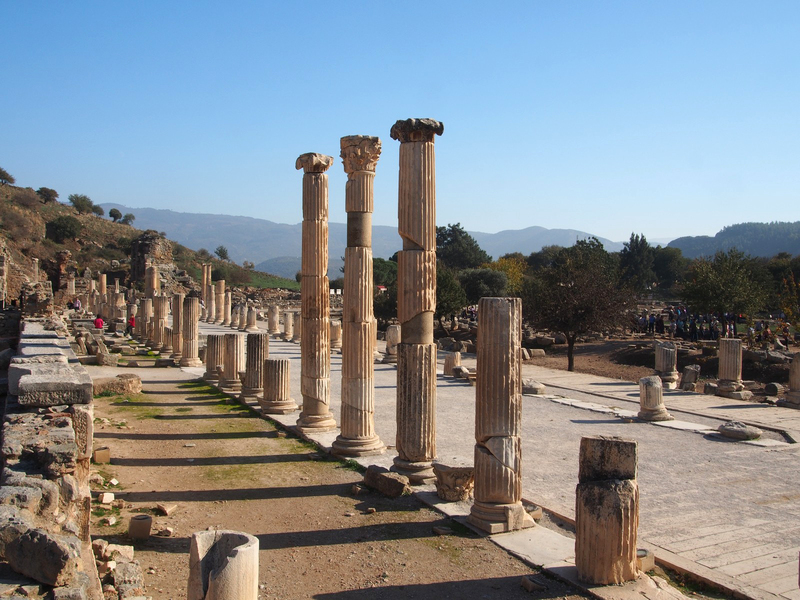 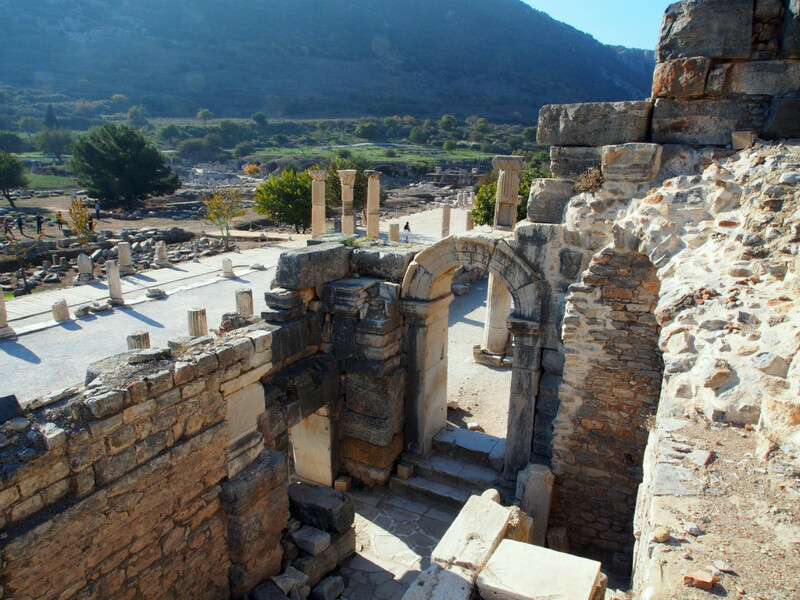 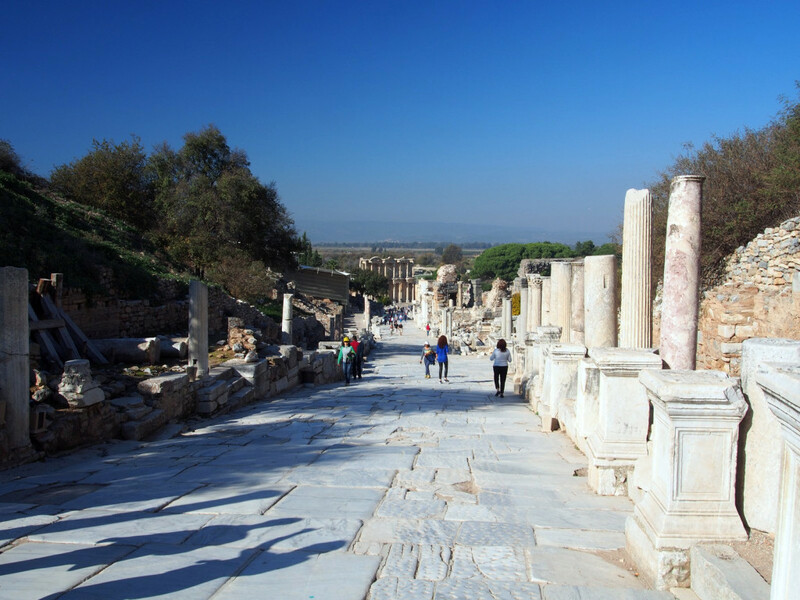 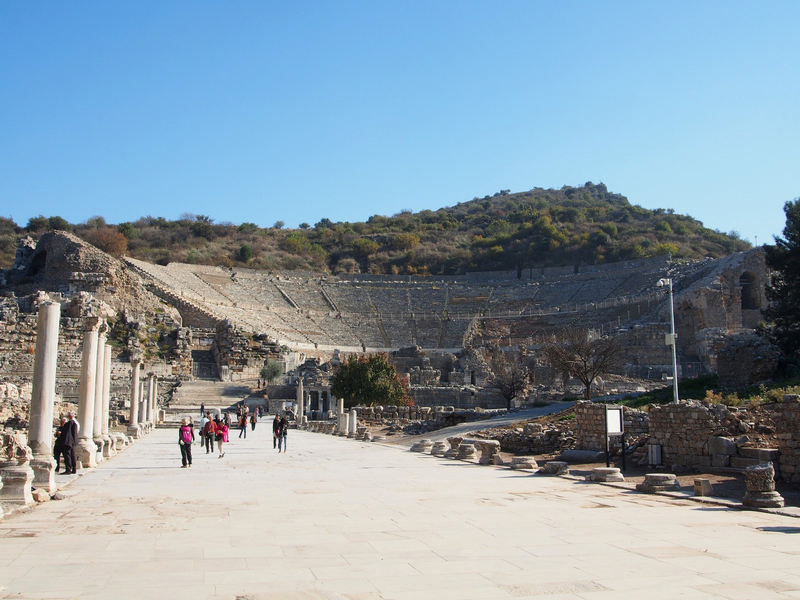 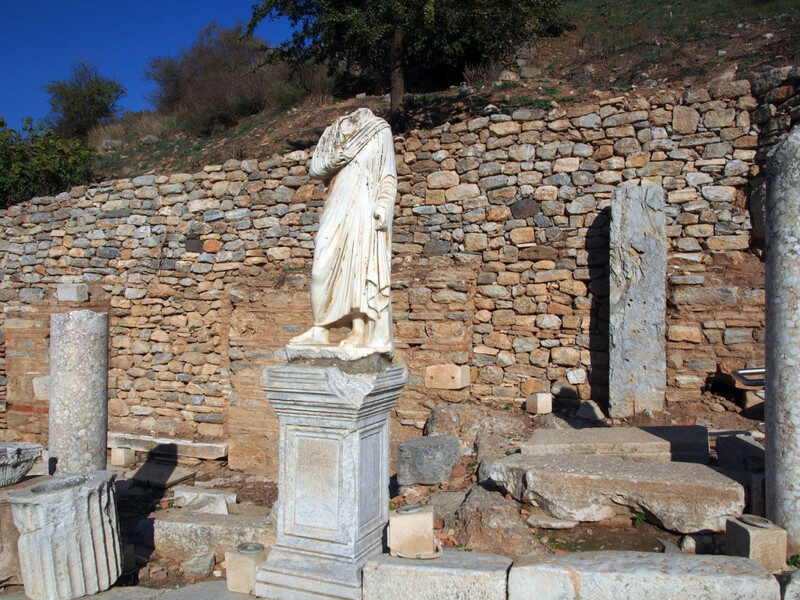 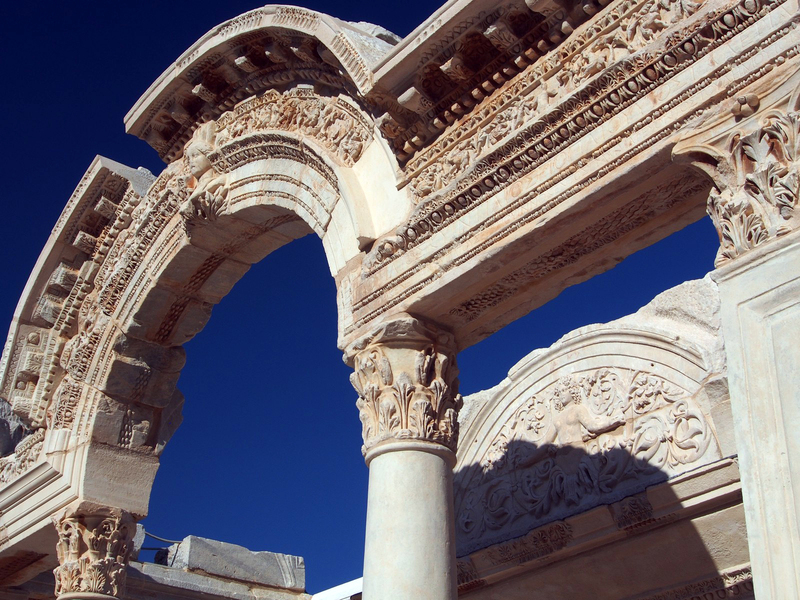 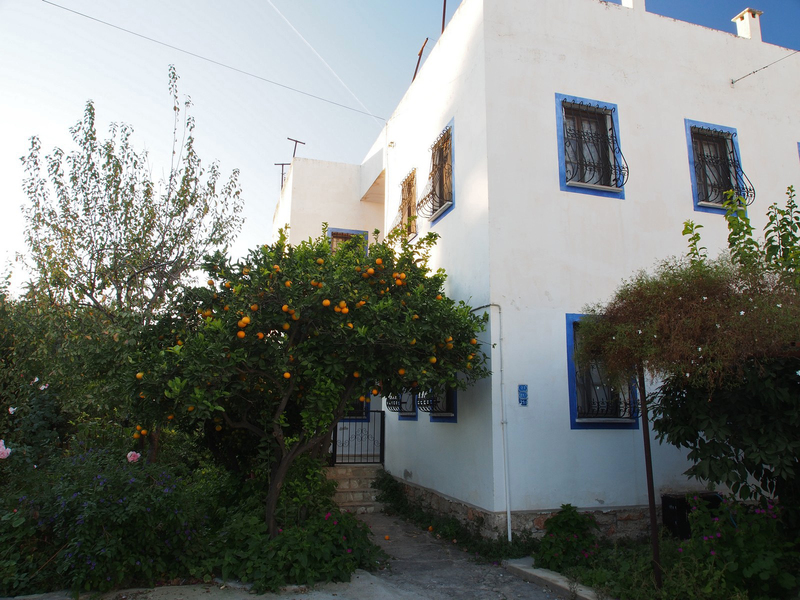 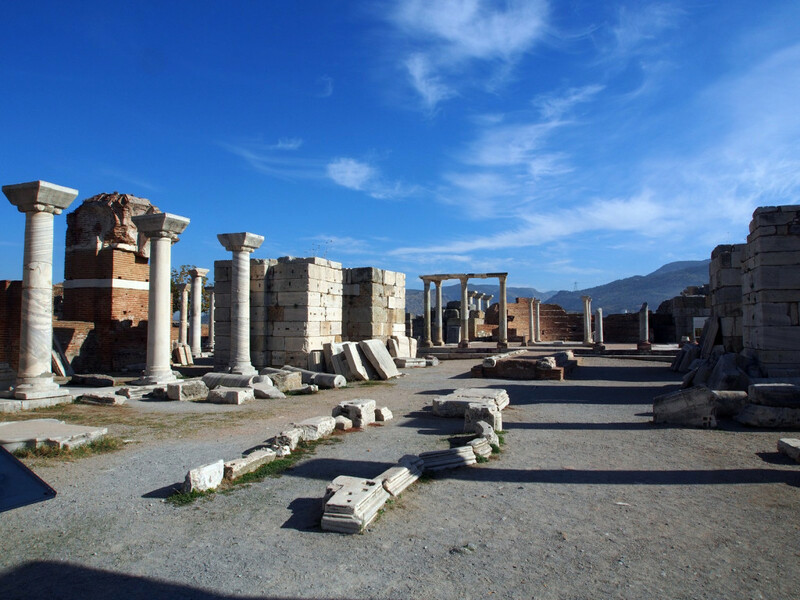 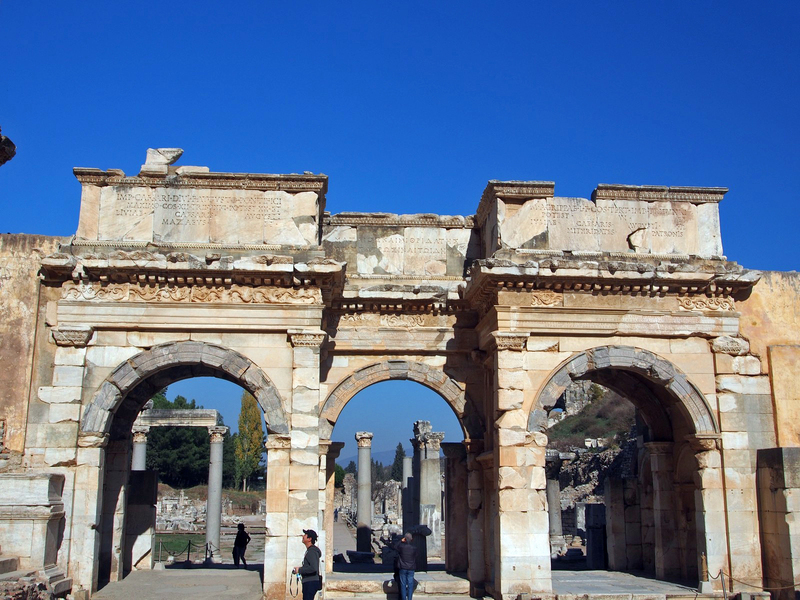 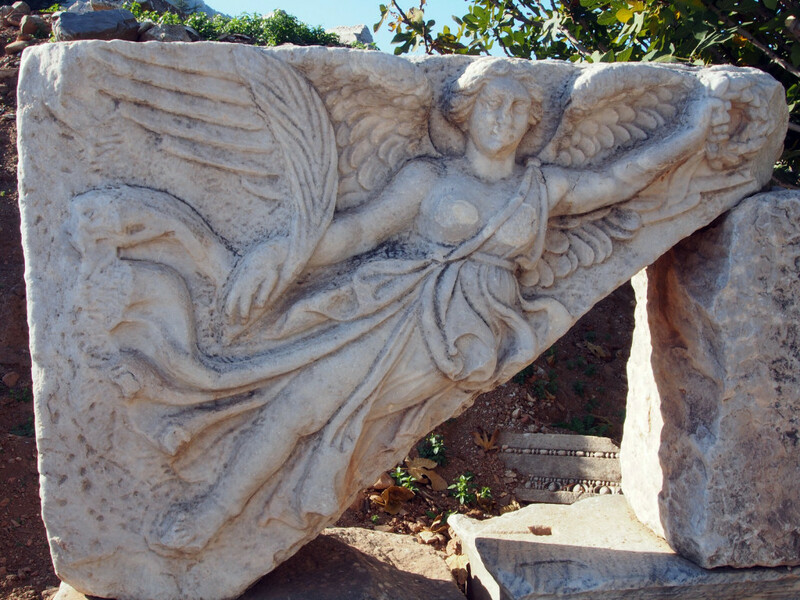 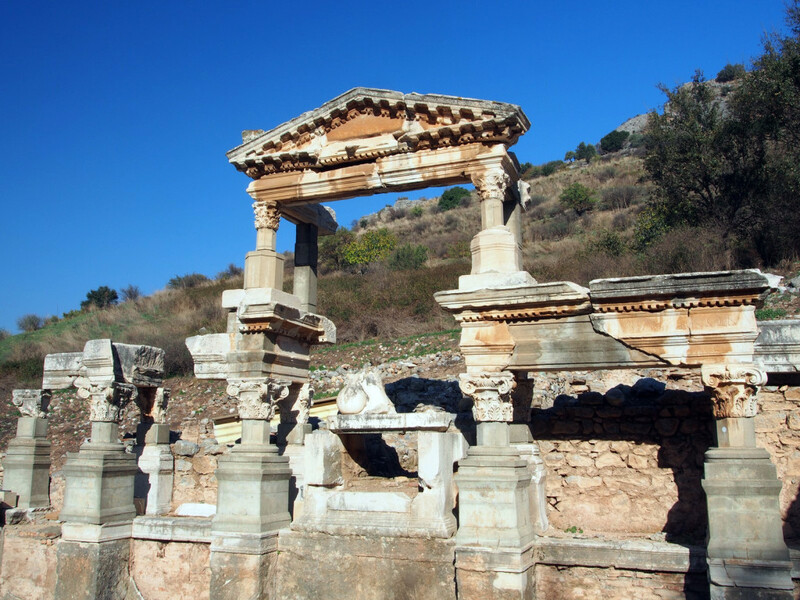 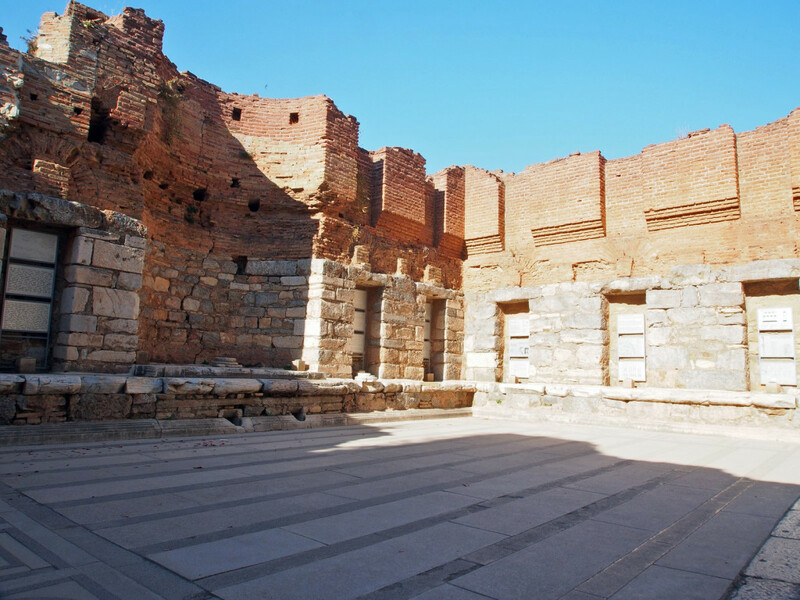 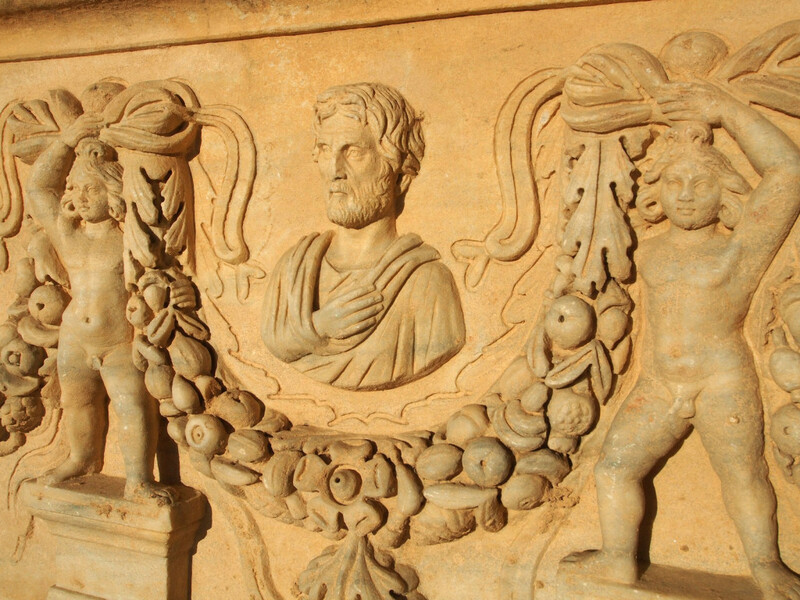 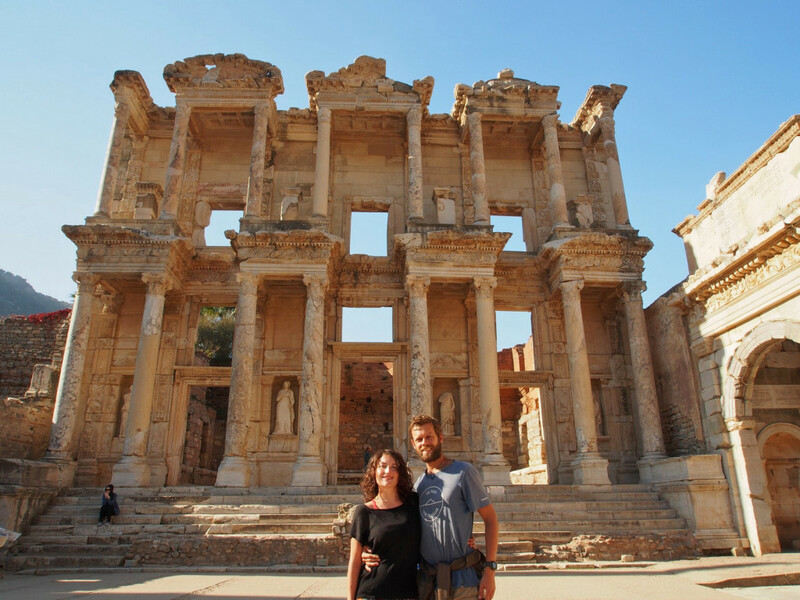 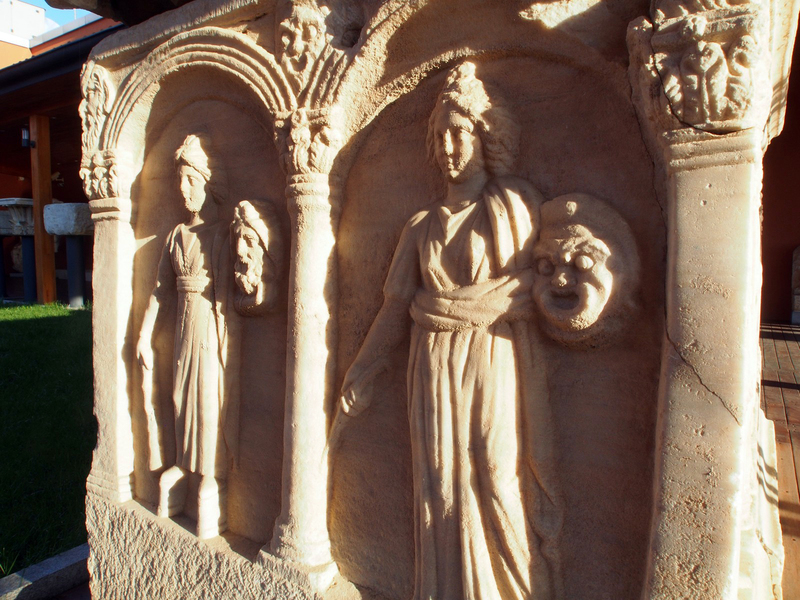 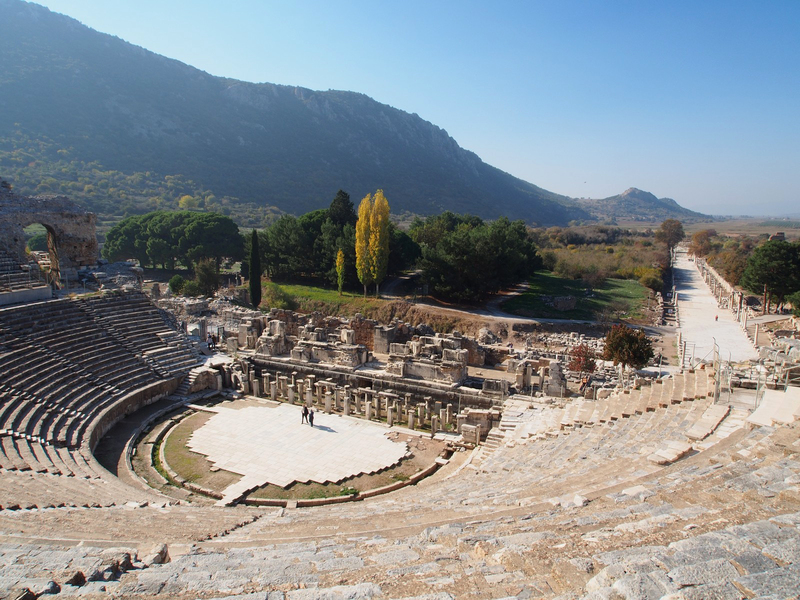 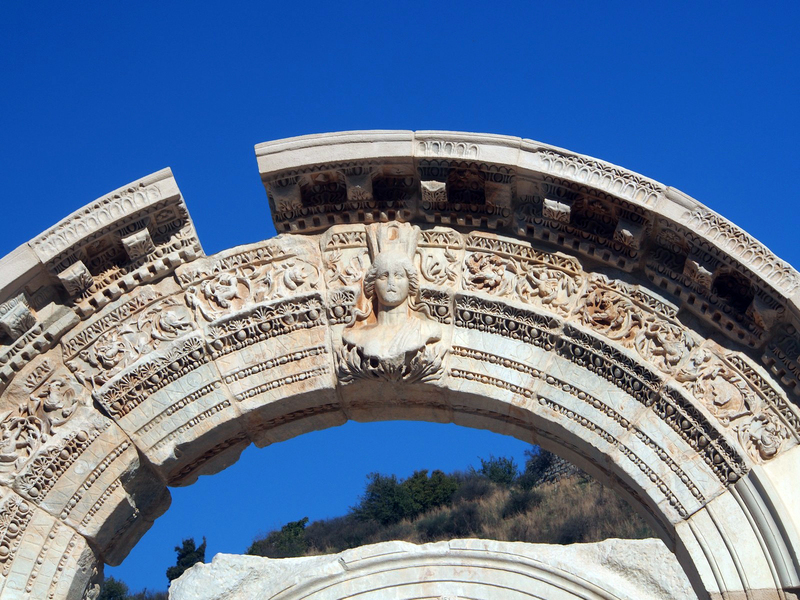 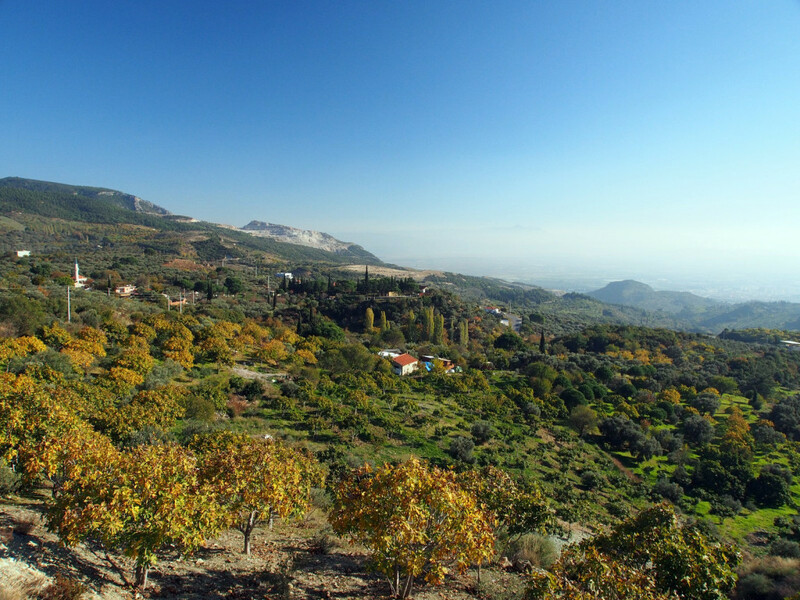 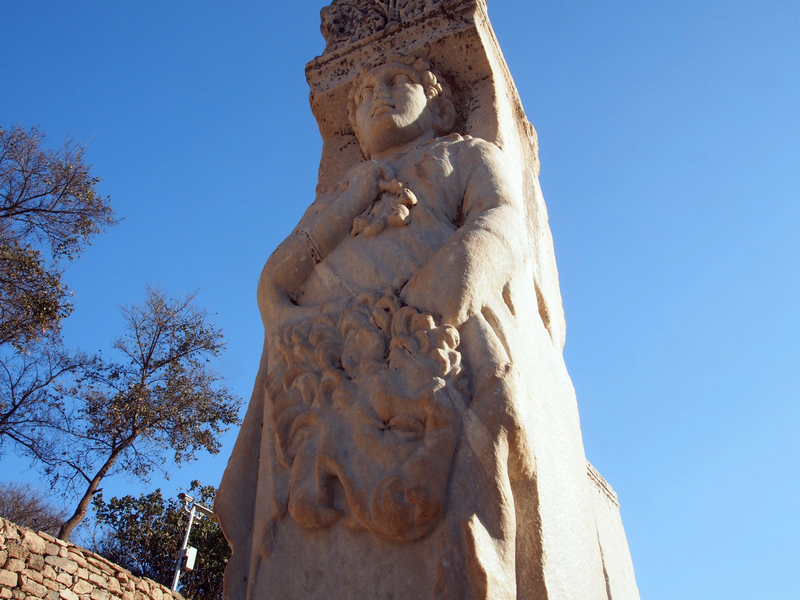 Selcuk is the modern town that serves as a base for the ancient city of Ephesus. 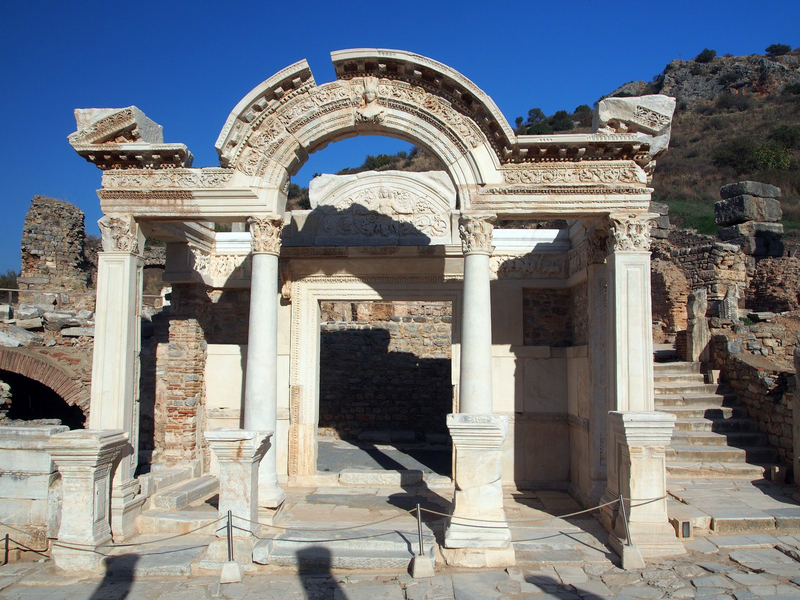 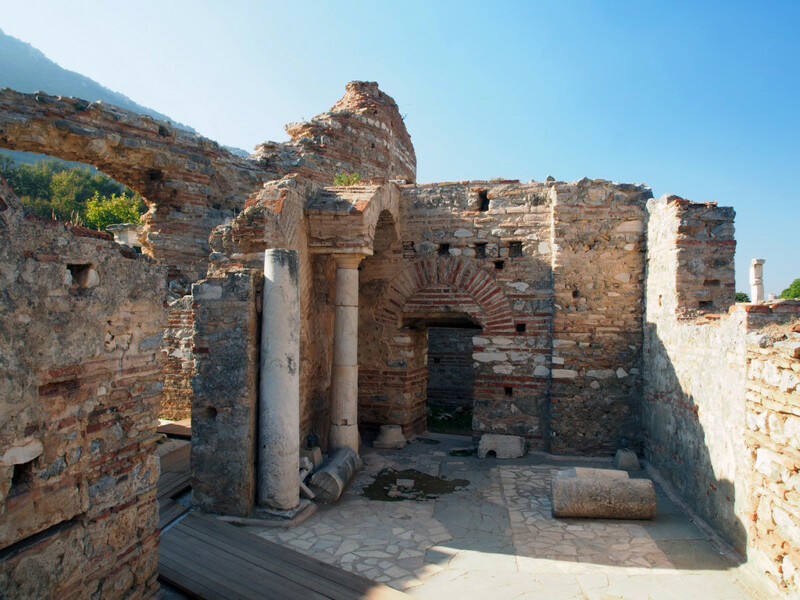 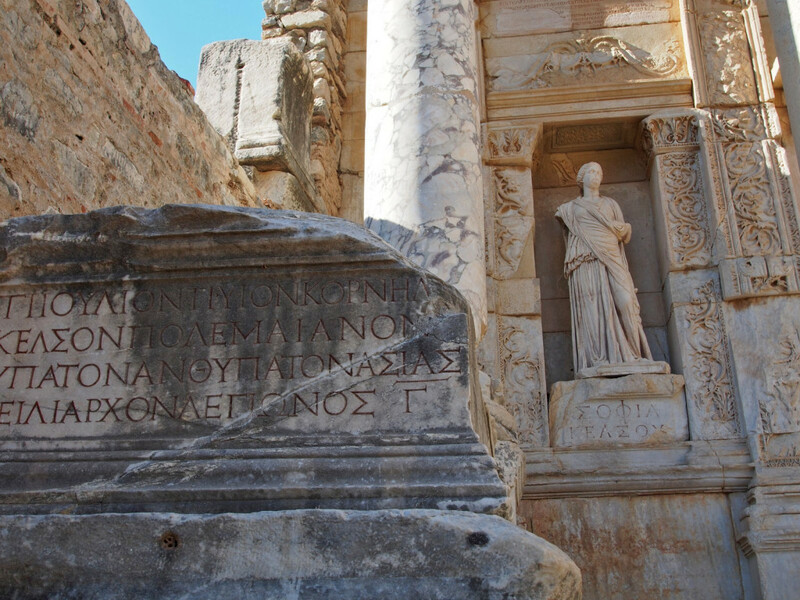 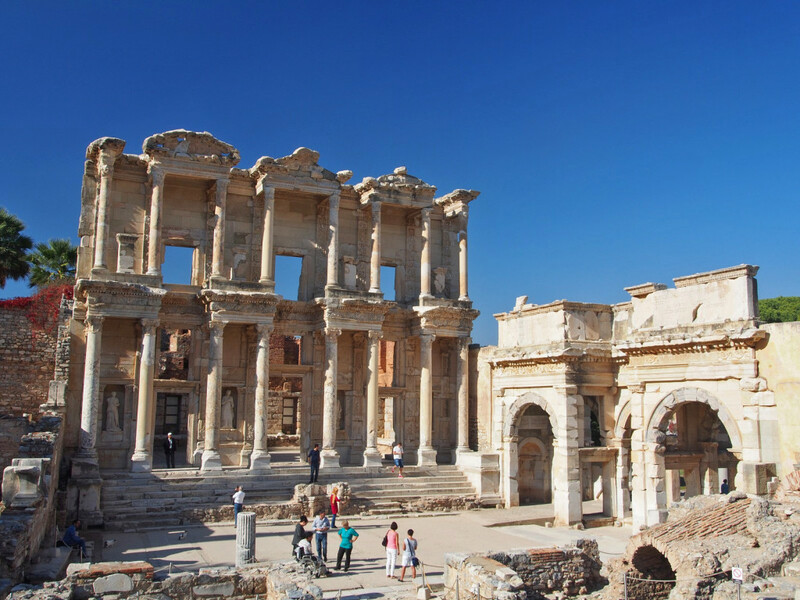 Ephesus was a hugely important city in antiquity – with over 8000 years of recorded history through Ionian, Lydian, Persian, Hellenistic, Roman, Byzantine, and Ottoman periods. 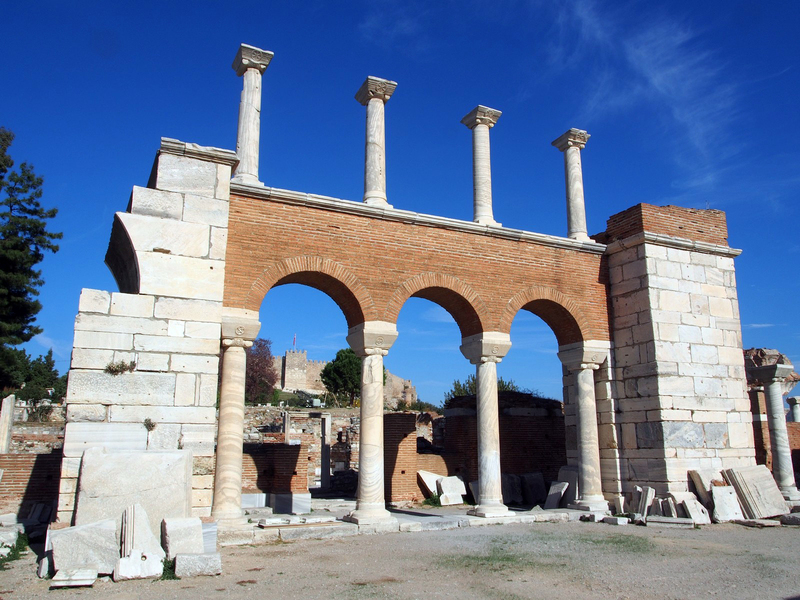 What remains today dates mostly from the Roman era, and is one of the best preserved archaeological sites in the world. 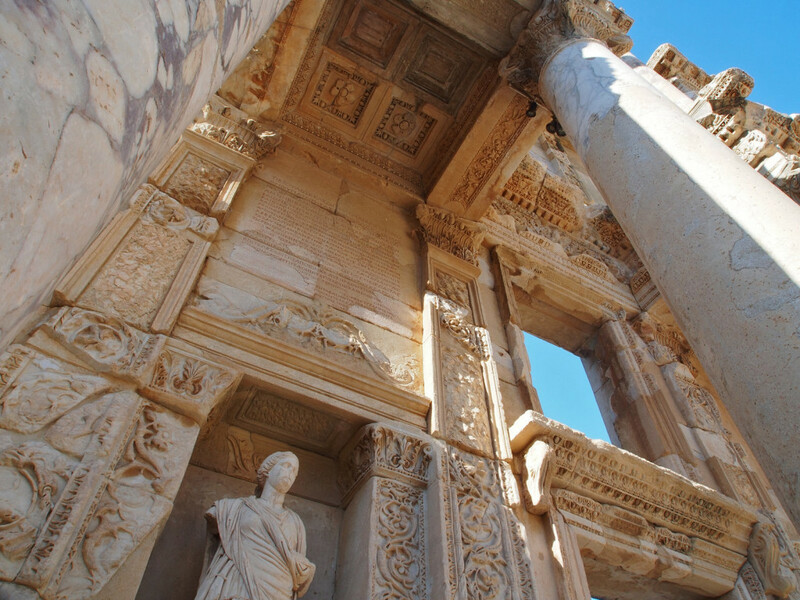 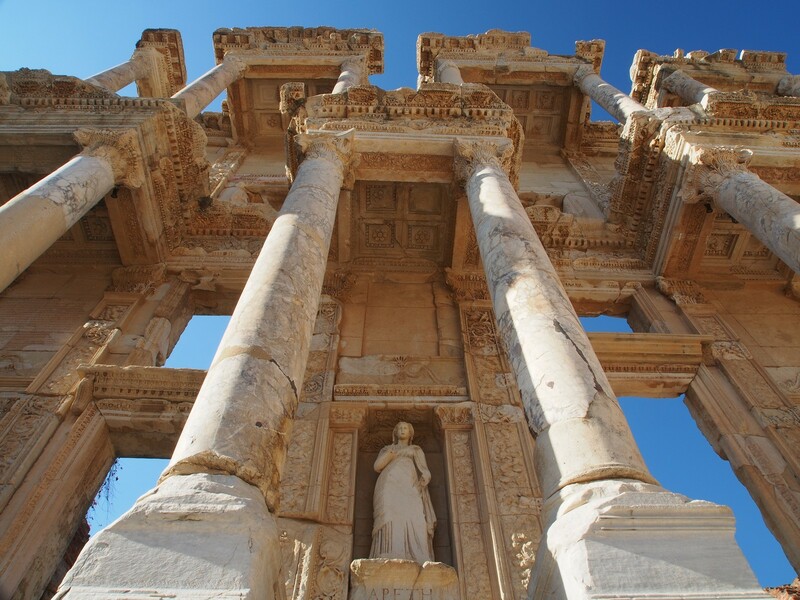 The most famous structure here is the library of Celsus, with an imposing two storey façade, containing four statues representing wisdom, knowledge, destiny and intelligence. 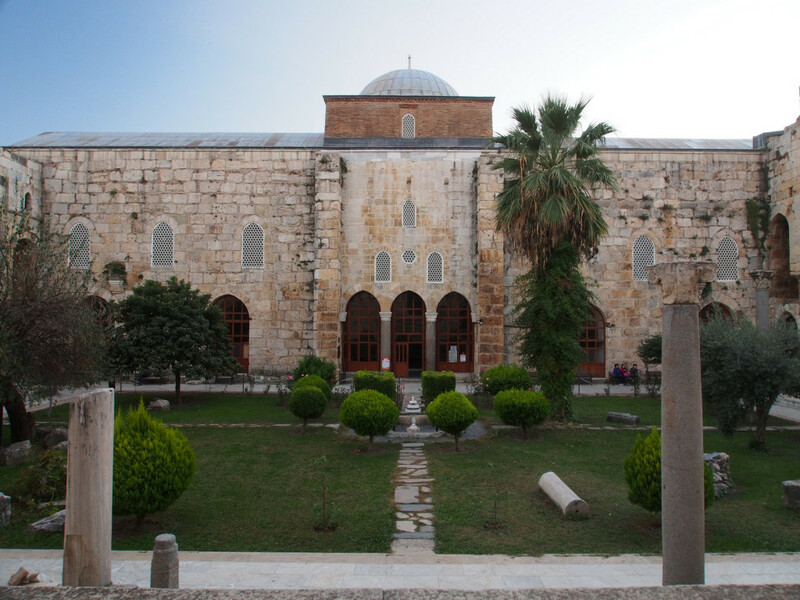 Inside is far more modest, but once contained an impressive collection of over 12,000 scrolls, and still houses the crypt of Celsus, once a consul of Rome. 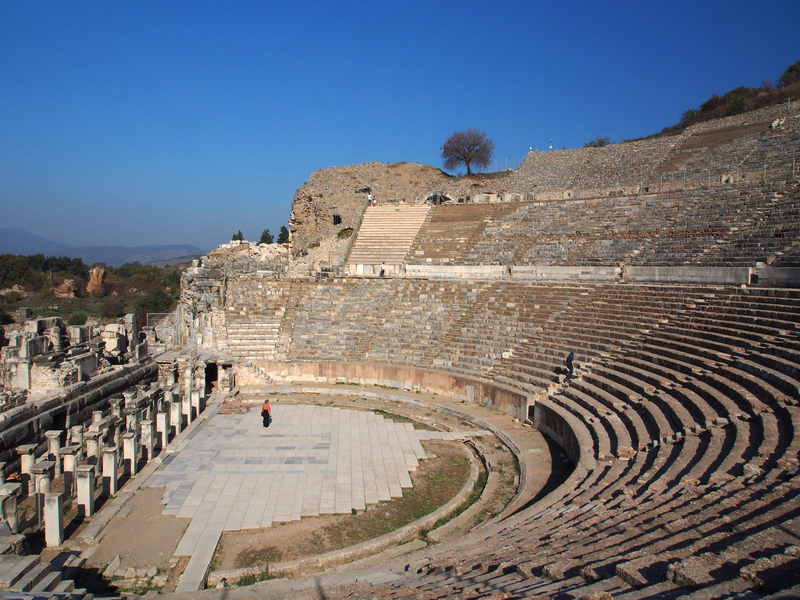 There is also an enormous amphitheatre, capable of holding 25,000 people – the largest known from antiquity. 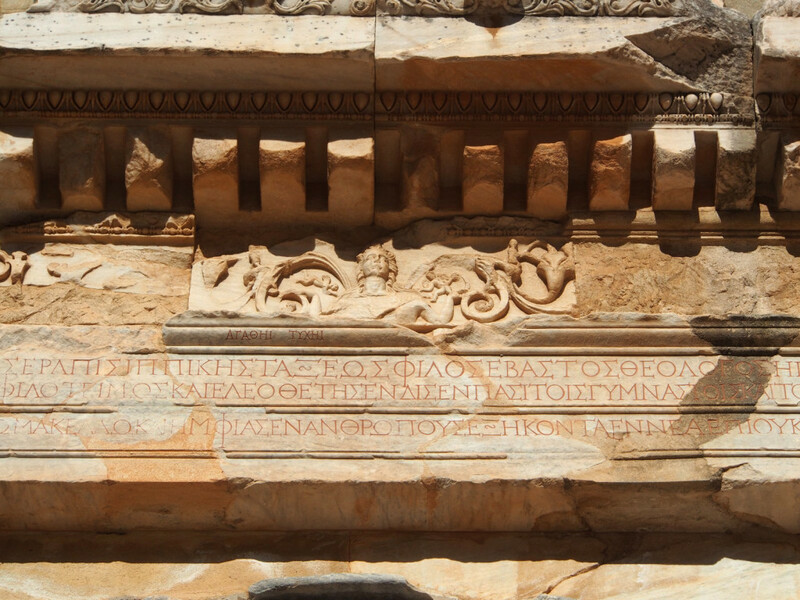 Hadrian’s Temple stands out among the smaller ruins, for the quality and completeness of its bas-reliefs. 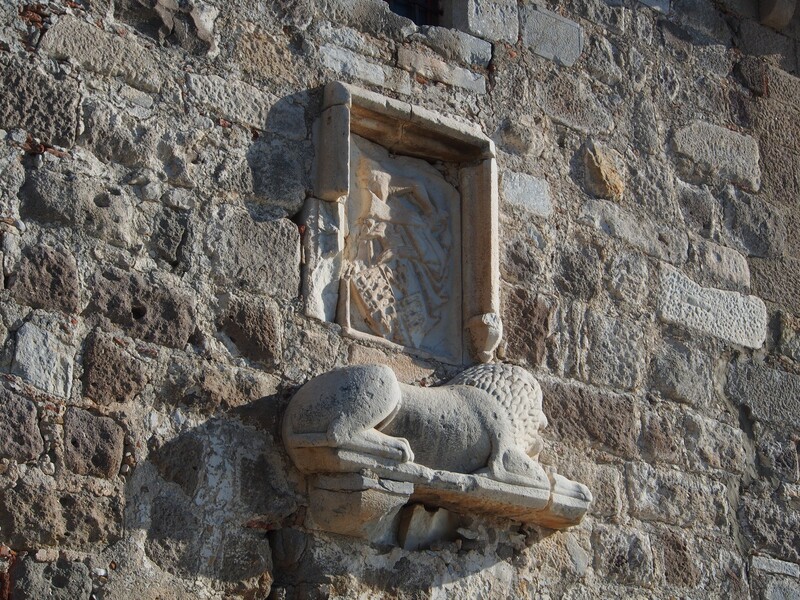 As ever, there’s as much if not more interest in the smaller details, rather than just the large buildings. 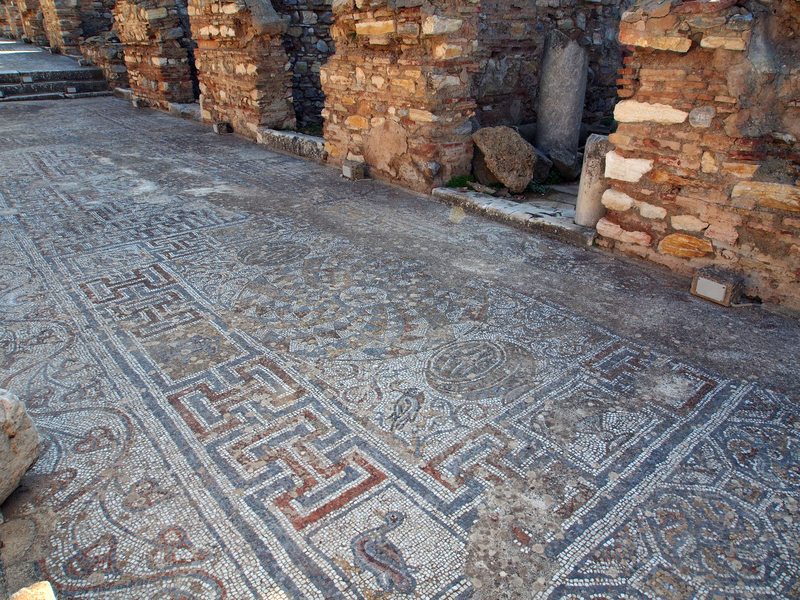 There are some remaining sections of mosaic floor tiles, and rows upon rows of bas-relief carvings and statues. 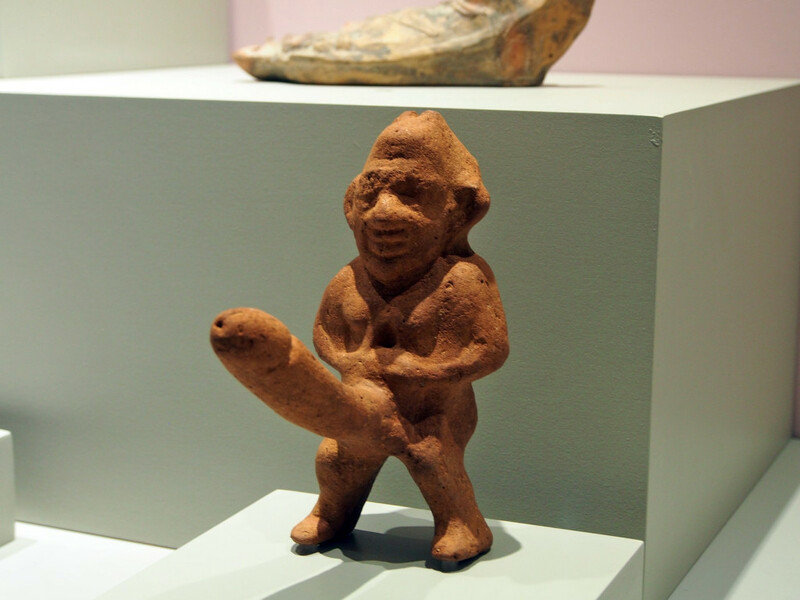 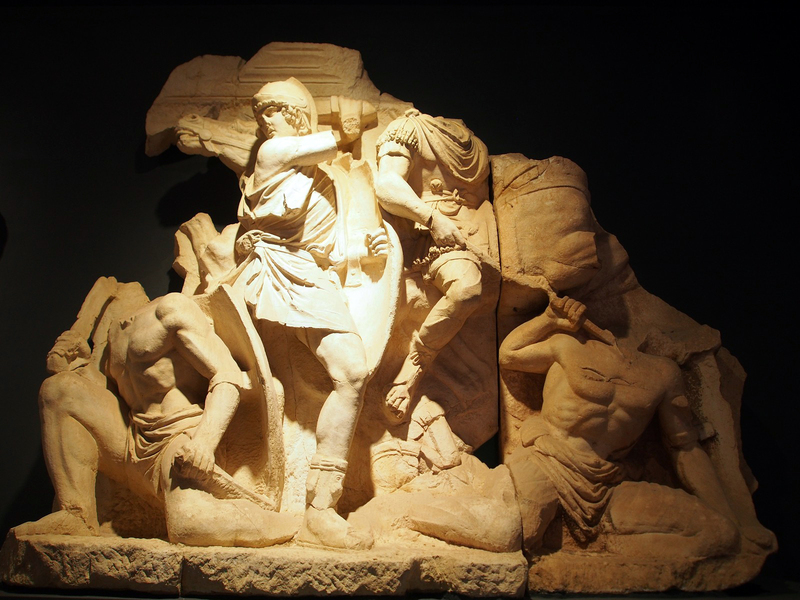 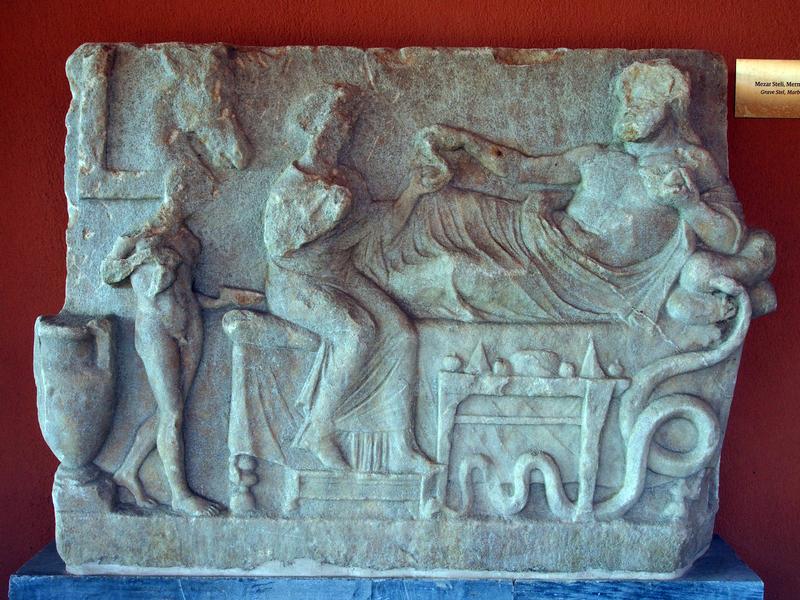 The best of the statues and reliefs have been removed to various museums – the British Museum is as usual a significant recipient, but the local museum holds some of the best statues and reliefs. 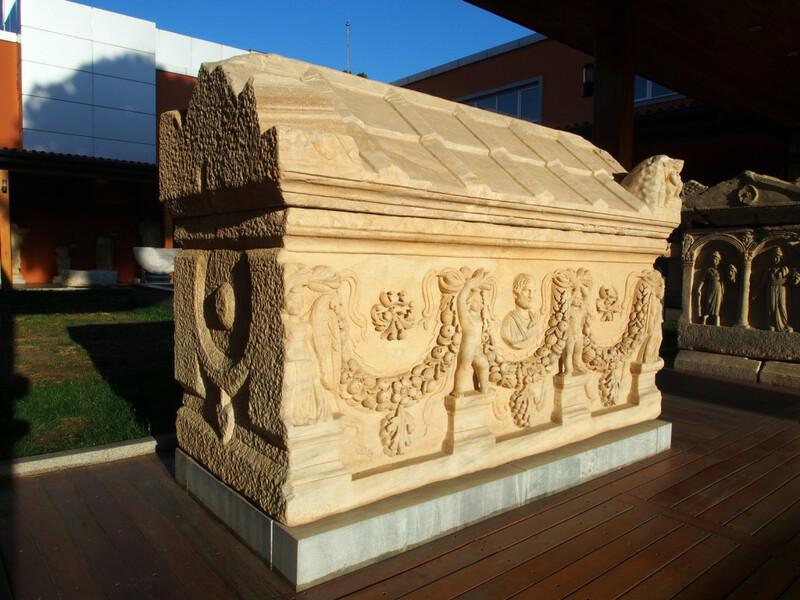 There’s also some large sarcophagi in the courtyard outside. 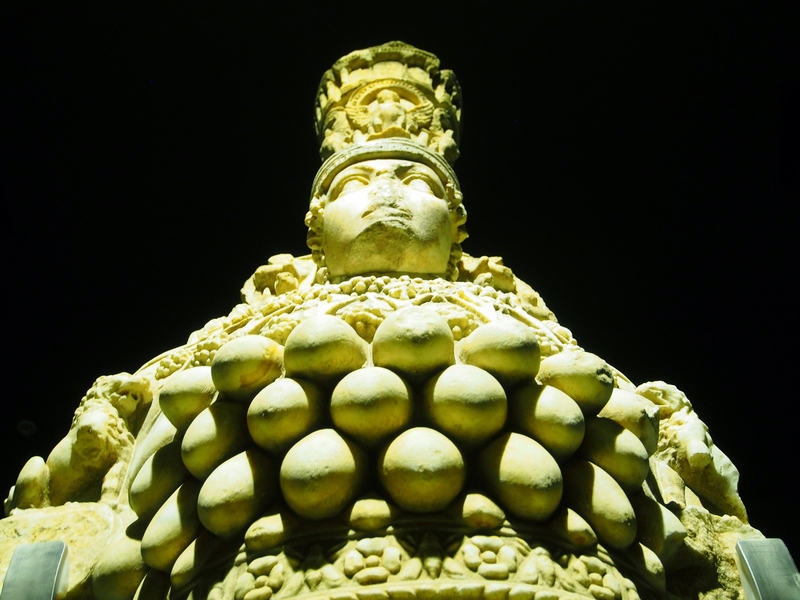 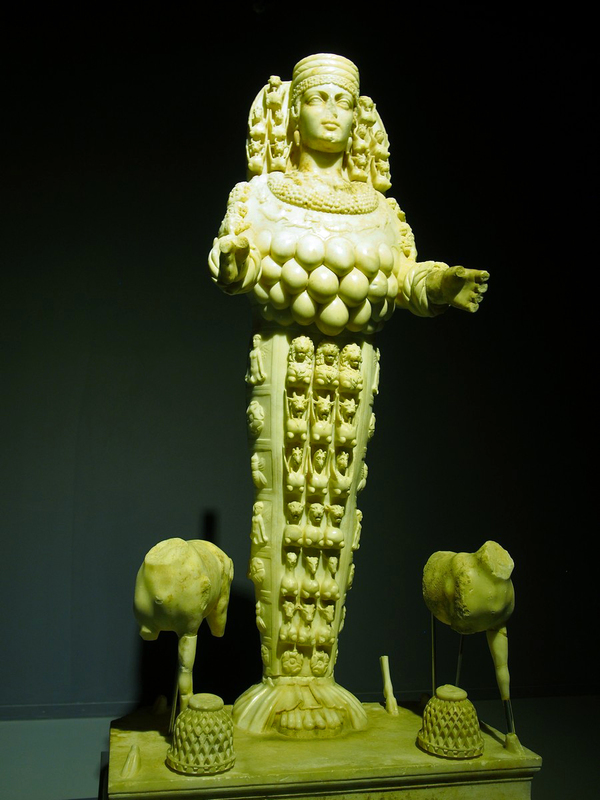 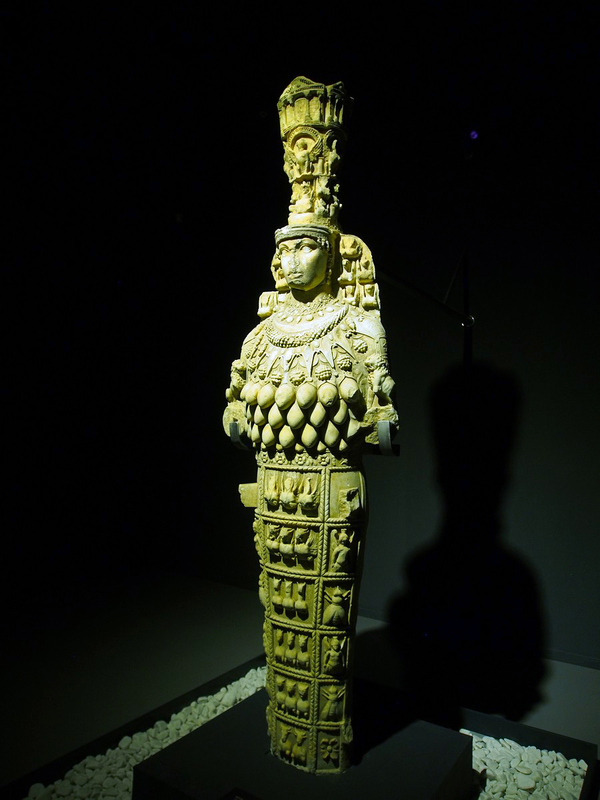 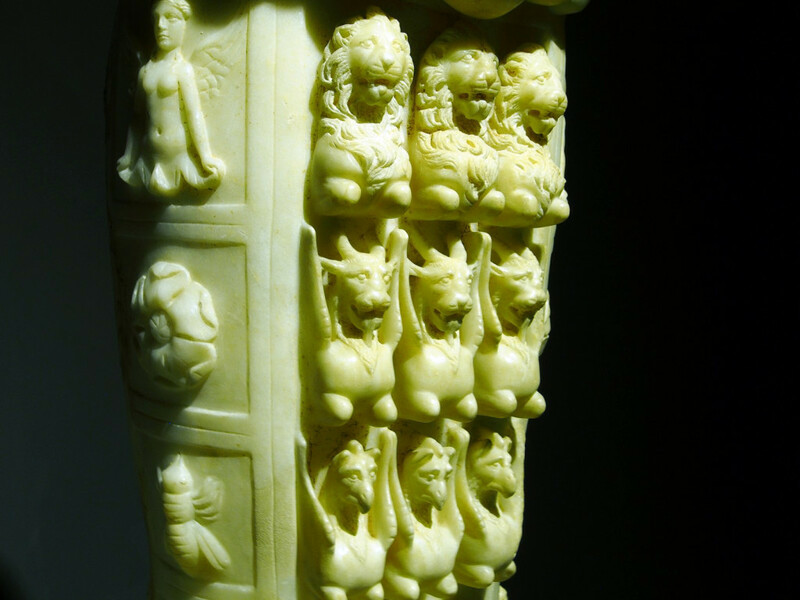 But the undoubted jewels in the crown are the two large marble statues of Artemis, covered with intricate carvings. 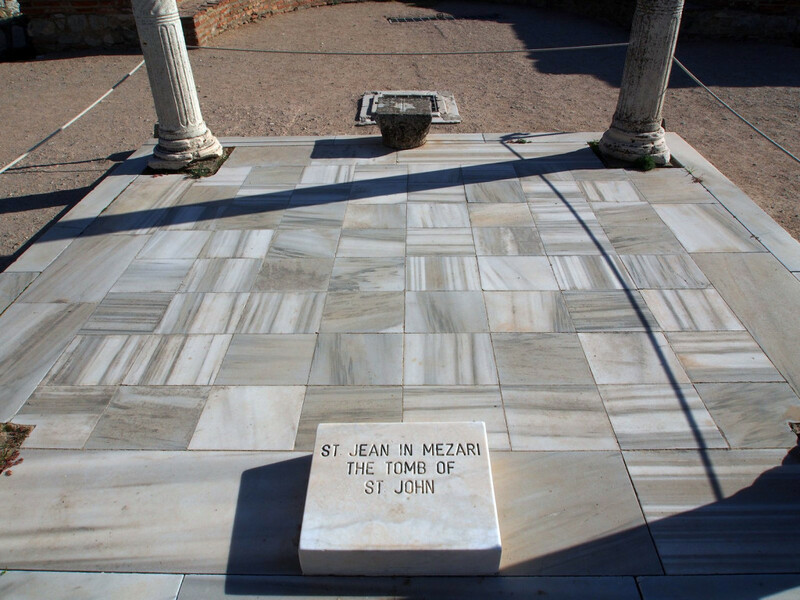 The town is also home to the Basilica of St John, as well as his tomb – he lived most of his later life in the city. 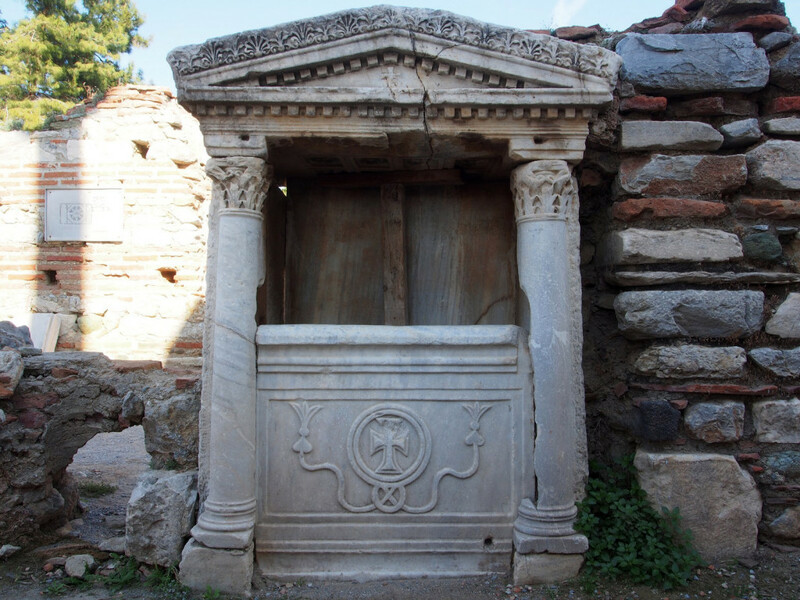 The original small church marking his tomb was replaced in the 6th Century by the Byzantines with this impressive structure. 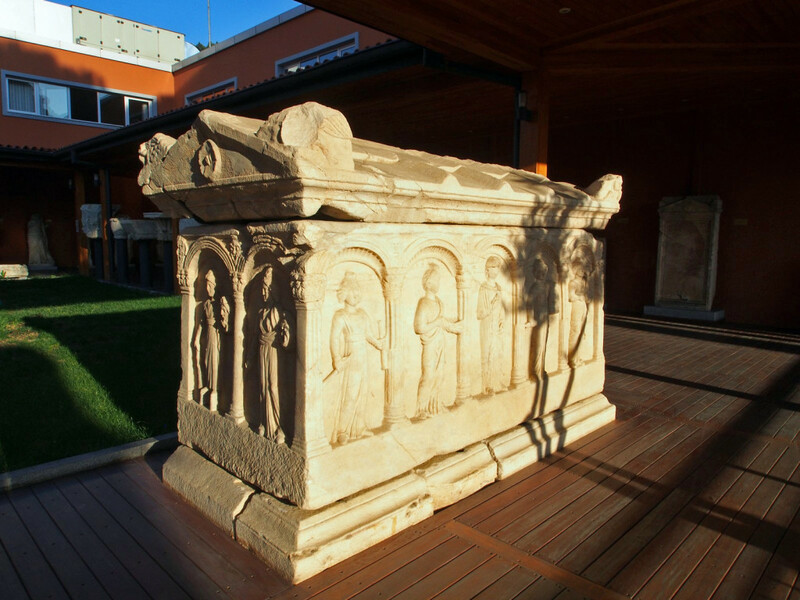 The tomb itself is plain. 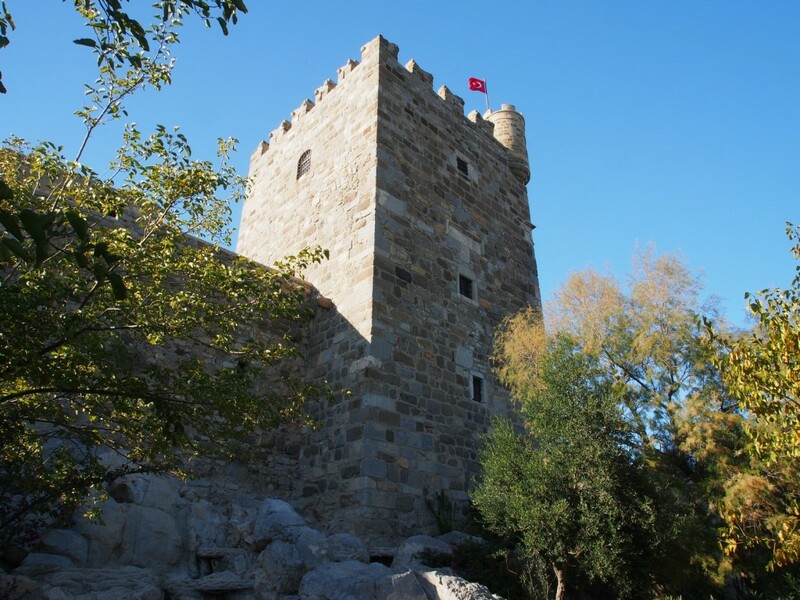 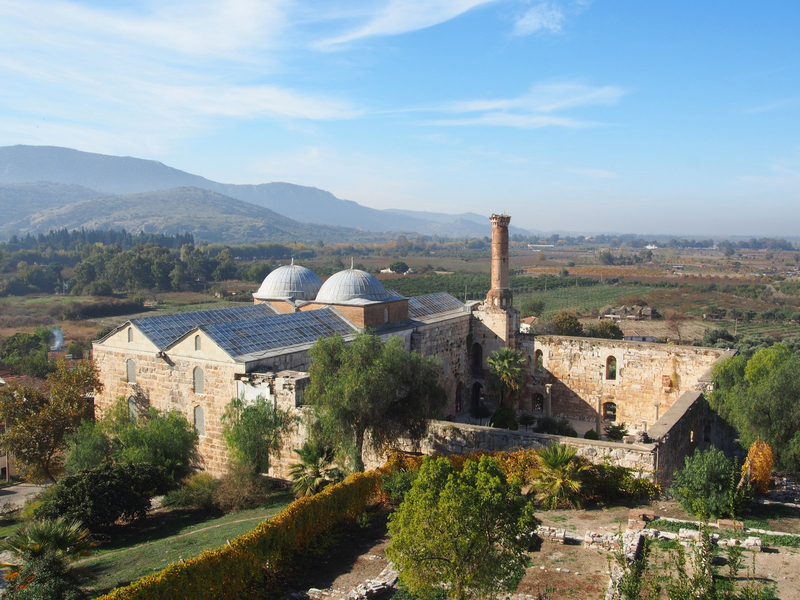 Also around Selcuk are the Isa Bey Mosque, dating from the 14th Century, and a large castle overlooking the town. 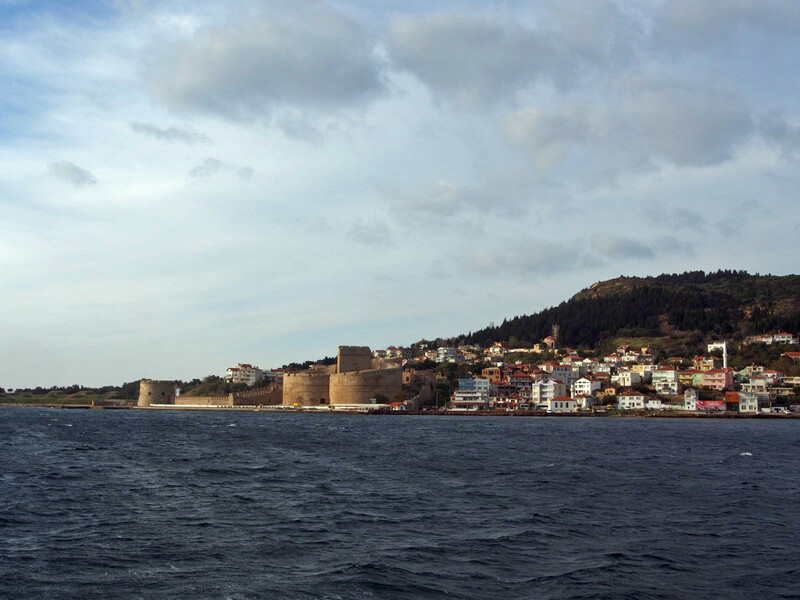 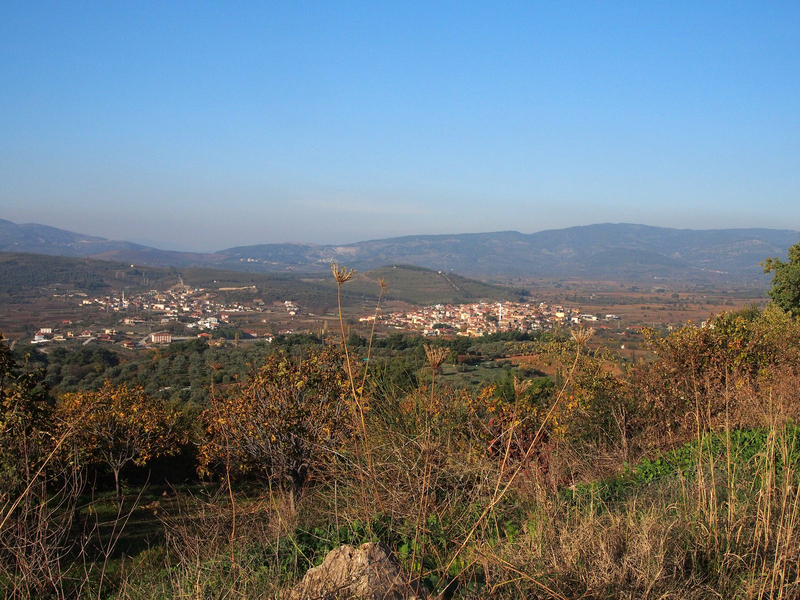 From Selcuk we pushed north to Canakkale, just on the southern side of the Dardanelles, the narrow opening where the Sea of Marmara empties into the Ionian Sea and thence the Mediterranean. 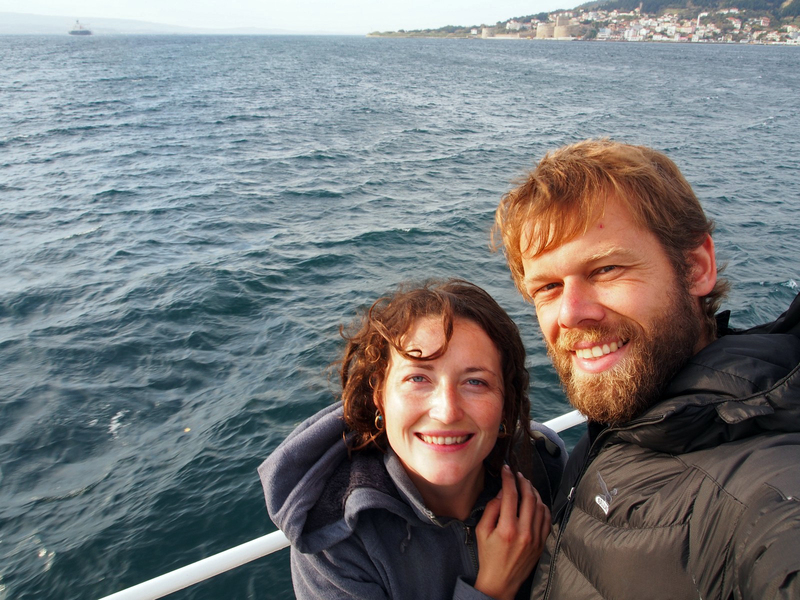 It’s the boundary between Asia and Europe, and after 263 days on the road, we finally crossed over into a new continent.